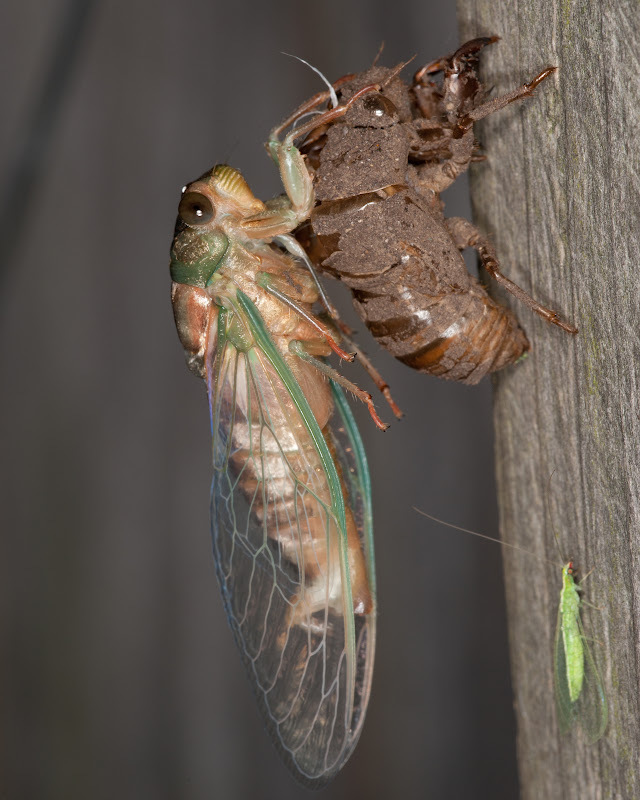 Up from darkness they will come...cicadas, that is. 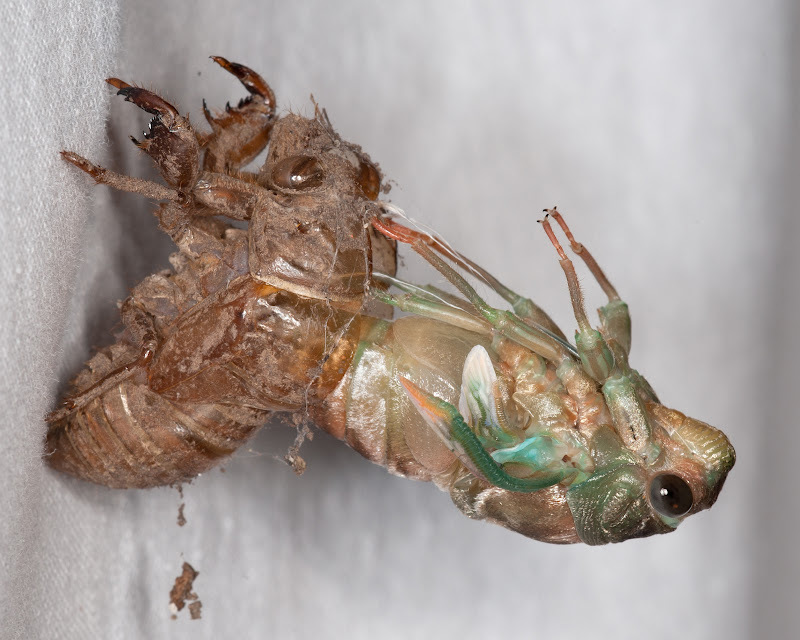 Their life cycle is a fascinating one. 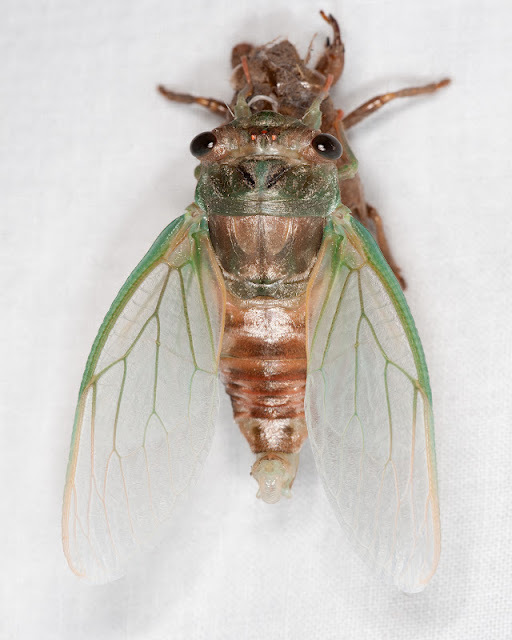 The realm of darkness is where a cicada spends most of its life. It all begins with rice-sized eggs being deposited into a small tree limb. Tiny nymphs hatch from the cluster, and fall down to the inviting earth, burrowing into the deep soil that will nourish and protect them while they mature. 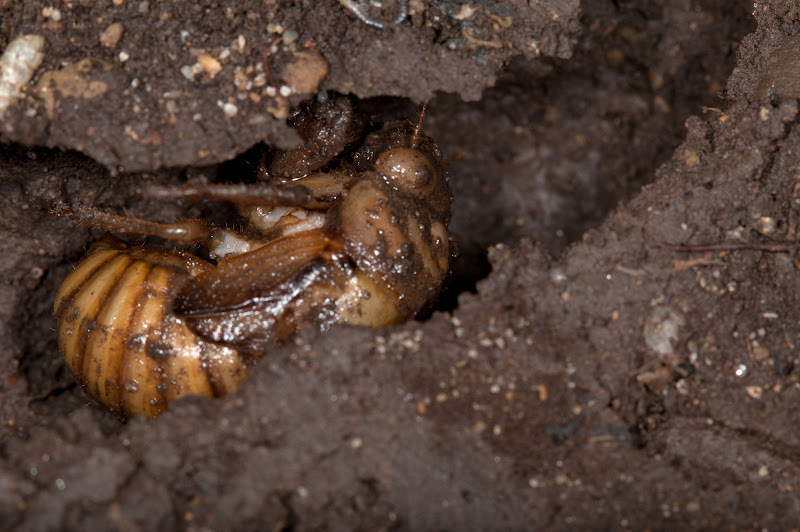 This unseen life stage process could take anywhere from 2-17 years, depending on the species, and could happen anywhere from 1 foot to 9 feet underground. 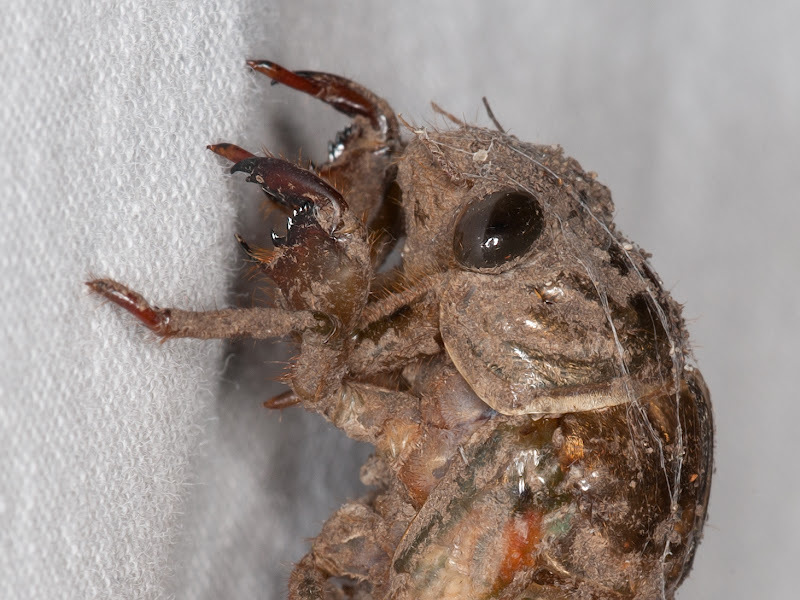 While in their dark tunnel, cicada nymphs will feed on the roots of trees and shed their skin several times as they grow larger, completing several stages of maturity. 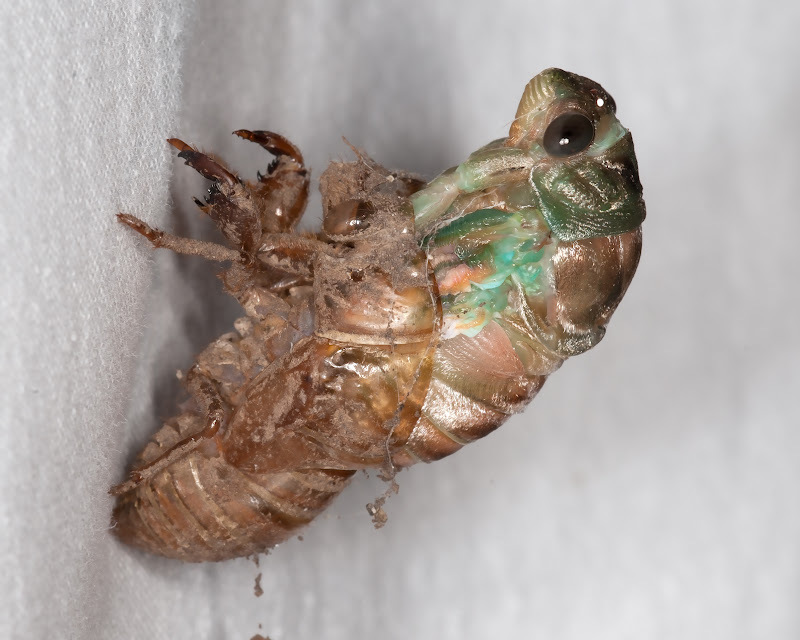 A cicada in one of the later nymphal stages, not yet ready to leave the ground. 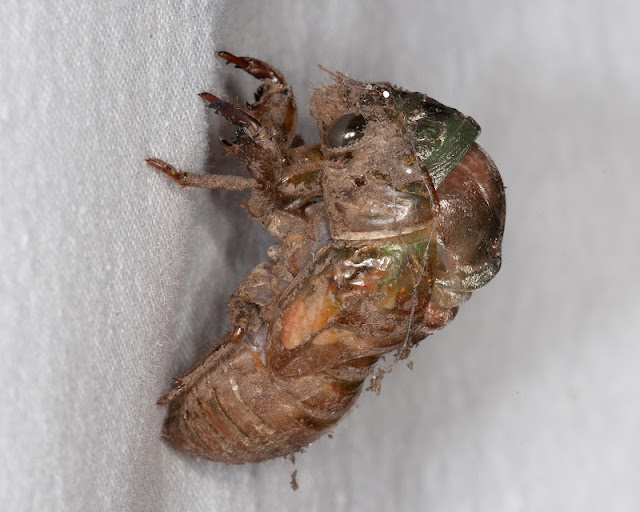 Somewhere late in the maturation process, the cicada gets an "urge to emerge" and he heads upward from deep below, toward the surface of his dark hiding place, digging and tunneling with his specialized, strong front legs. A night ritual is in his near future. Now he awaits just under the surface of the earth until the temperature and conditions are just right. Nature then calls to the cicada to exit the safety of his black cavernous dwelling and beckons for him to continue onward and upward. 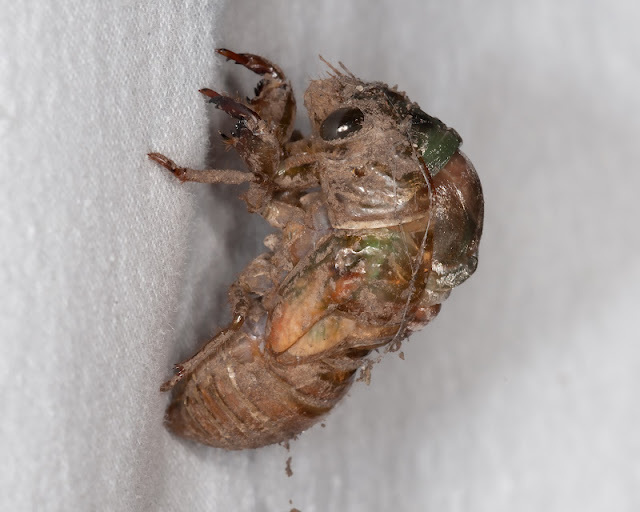 The cicada now crawls over the soil and searches for the nearest vertical surface to begin his journey upward to complete one more amazing transformation that will completely change his life. I was fortunate to be able to witness this incredible life change. 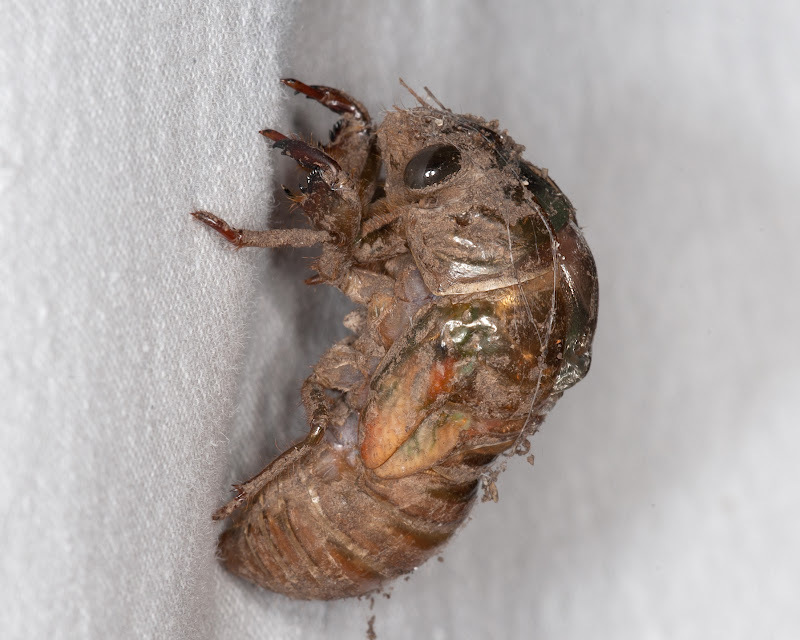 A few cicadas had exited their underground tunnels underneath a tree directly behind a fence where I had a white sheet hung to attract moths. A couple of them climbed up and over the fence and onto the sheet where my bright light was, so I captured the process in pictures. 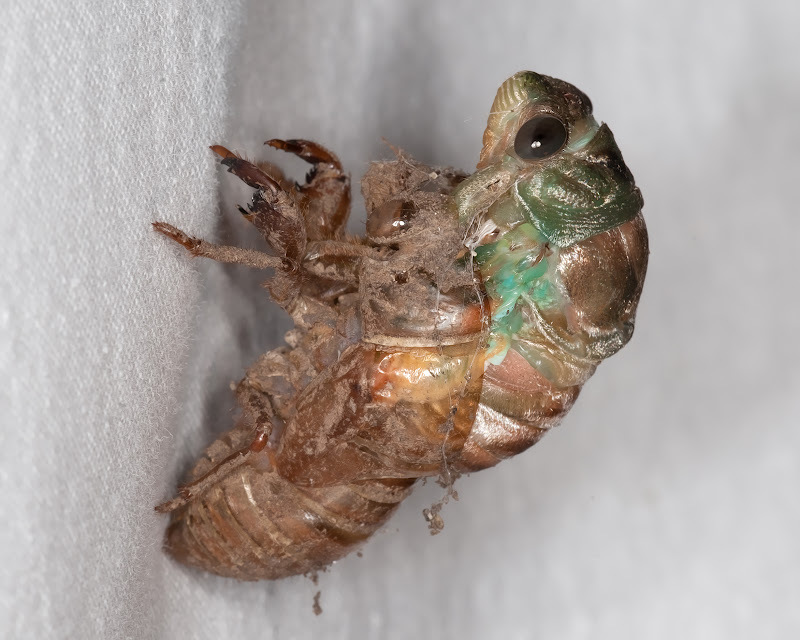 A cicada in his final nymph stage that just crawled up from below the ground and is ready to begin his transformation. Notice the fresh dirt and spider webs! Closeup to show the specialized digging apparatus on his front legs! No wonder they can excavate so well! This picture is a front angle of the picture above it. Notice in the pictures above, the gorgeous colors of the newly emerging cicada. His emergence was slow and steady almost like invisible fingers were gently pulling him. 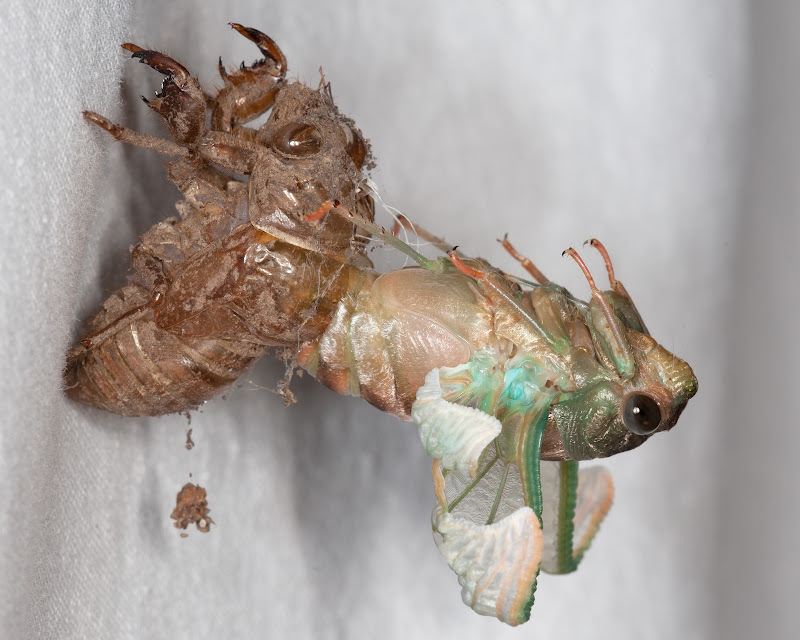 Incredibly, when the eyes were pulled free of the exoskeleton and they became dull, it almost appeared that there were now two creatures; one whose life had ended and one whose life had just begun. After that, the real struggle was over and this new, active, fresh cicada was intent on his final escape! He accomplished a graceful back bend, then at the last minute when you might think he was going to fall, he pulls himself back up by hanging onto his exoskeleton. The shell that once protected his soft body is now a sturdy base from which to to rest, as the life force began its surge through his body and wings. This is another cicada that had already emerged when I started photographing the one on the white sheet. Notice how his wings have fully filled out and have become clear. He is now ready for flight at the first sight of daylight! 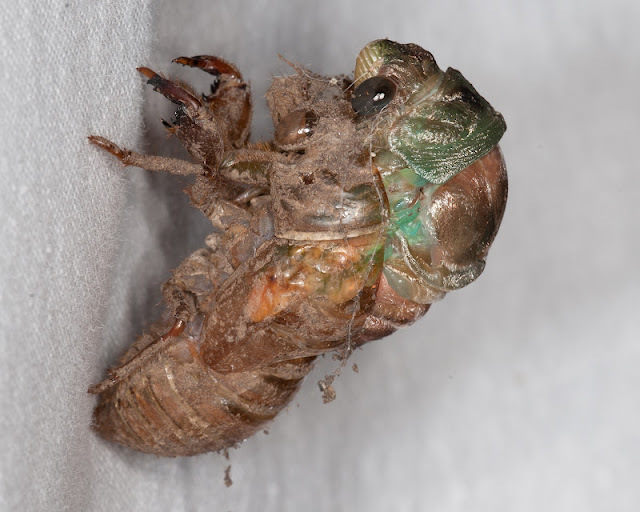 Above-ground life lasts only a precious 5-6 weeks for the adult winged cicada. 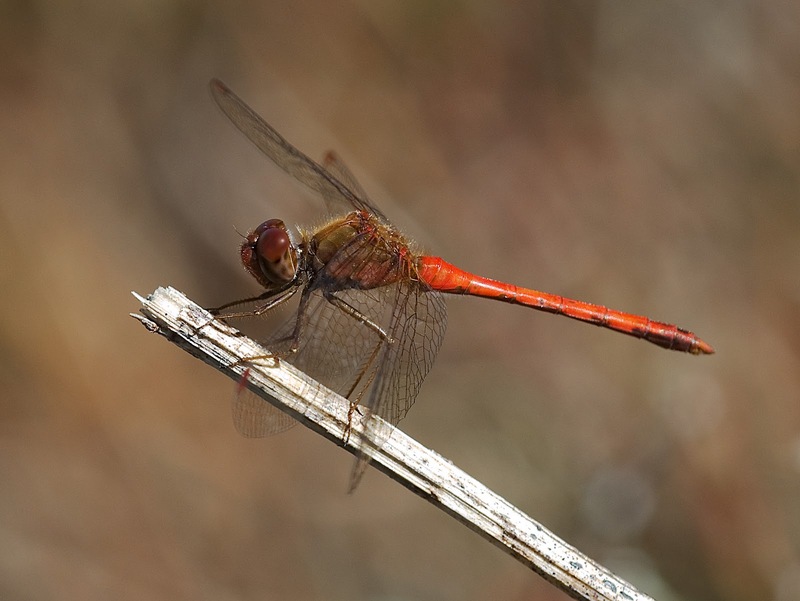 The males will sing to attract females, and reproduction will ensure that new generations continue. The life cycle will once again begin, as tiny egg clusters deposited into small limbs and branches. 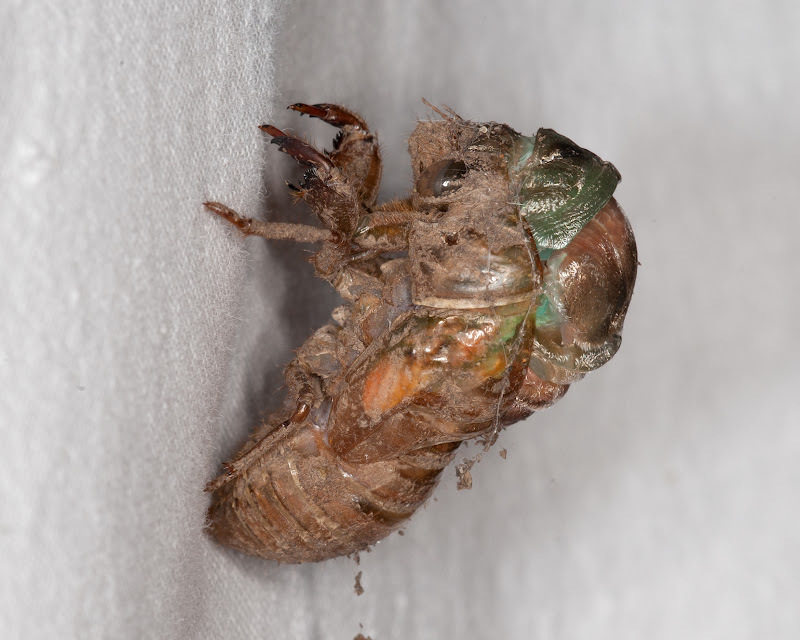 Predation of this creature is very high as cicadas are commonly eaten by many birds, squirrels and other wildlife. There is a particular fungus that also kills many. 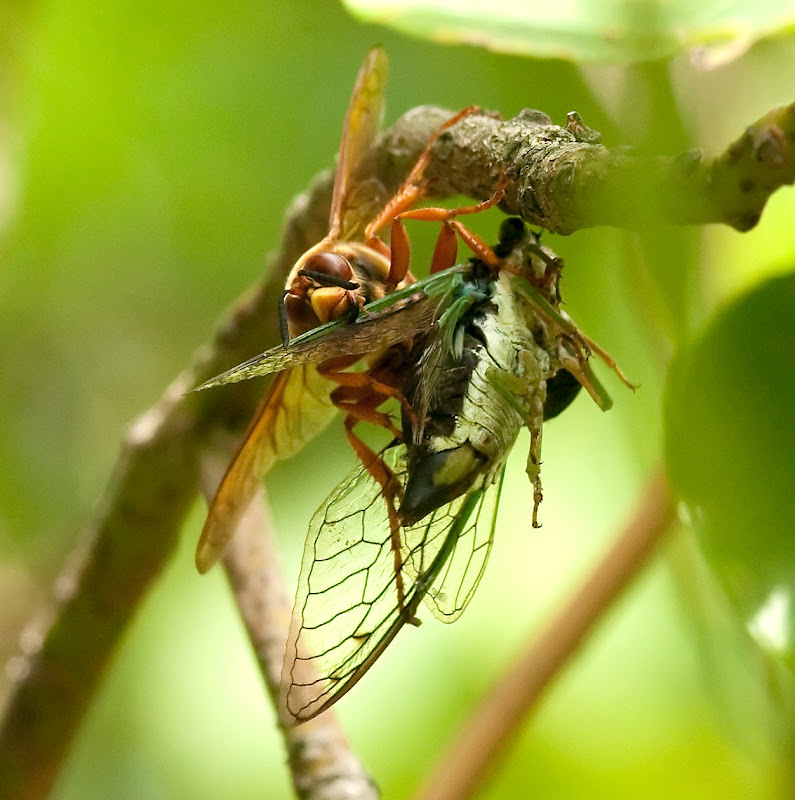 Another predator that hunts the cicada in order to feed its young is the Cicada Killer. 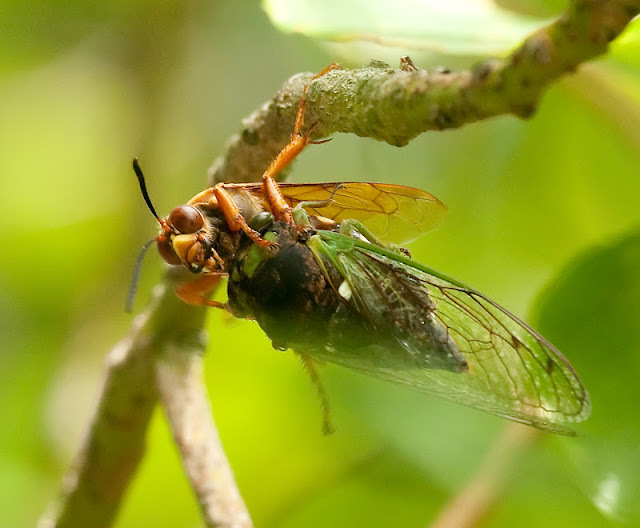 This is a very large wasp that will capture a cicada, paralyze it, spin it around and glide off with it to deposit into its ground nest, where the young will feed on it throughout the winter. I happened one afternoon to hear a raucous in the limb above my head, only to witness this very scenario. 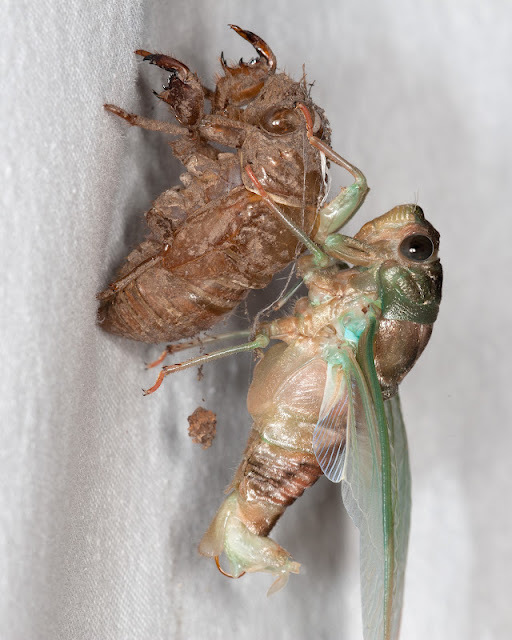 The pictures below are of the taking of a cicada by a cicada killer. It only took seconds for this whole violent scene to transpire. It was not a pretty sight, but I'm glad I had my camera! 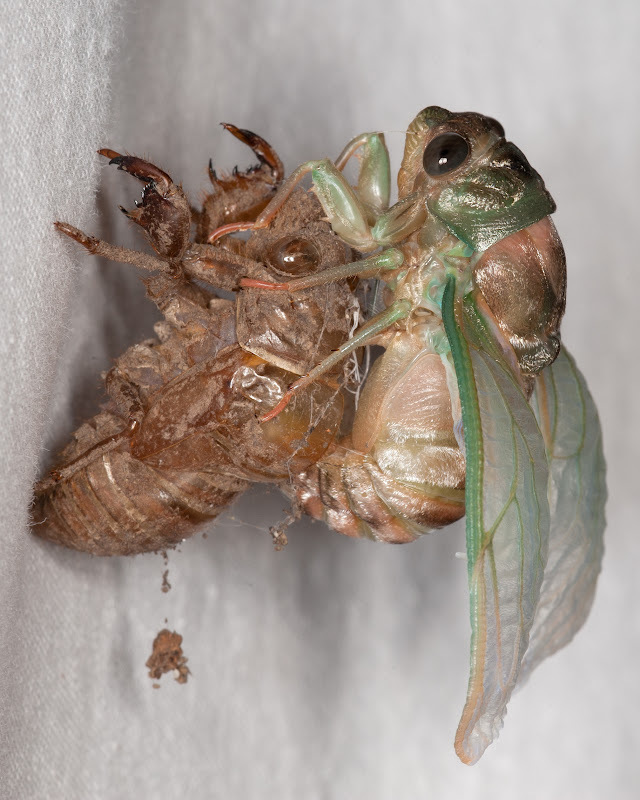 I have a whole new respect for the cicada. What an interesting journey and example of the yin-yang of life! As daylight ebbed and darkness crept in, we eagerly awaited the creatures of the night to emerge. Sounds like a line out of a horror story, but actually quite the opposite! I am referring to an impromptu evening of "Mothing" at Wahkeena Nature Preserve. 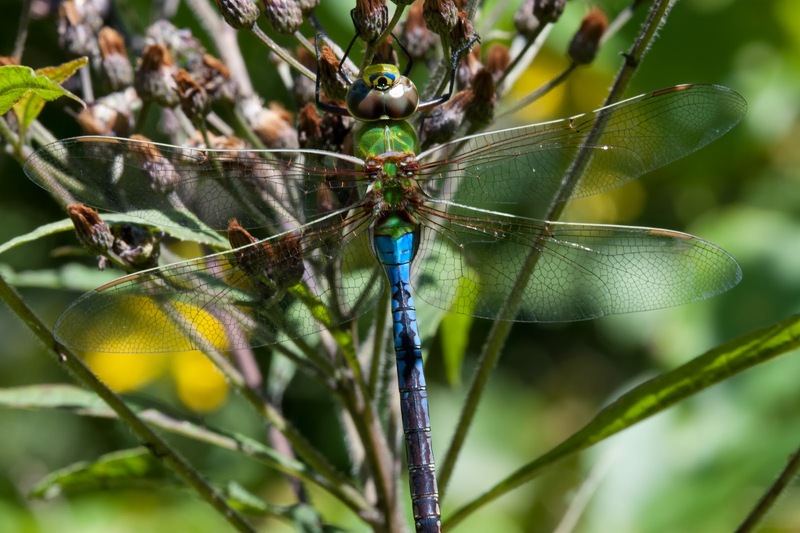 The members of this nature-loving group were Dennis Profant, Jim McCormac, Robin Wright-Strauss, Tom Shisler, Roger Grossenbacher, and Alex Webb. My husband and I throughly enjoyed the company and expertise of this fine group of professionals. The black, moonless evening and the harmonious ensemble of cicadas and katydids in the surrounding dense shrubbery seemed to set the stage; enticing those of the silent and secret Lepidopteran kingdom to revealing themselves. Well, maybe it was actually the mercury vapor light and the white sheets that beckoned the moths from their hiding! Whatever the attraction, we had a plethora of winged activity that caused many ooh's and aah's for a few hours. The surprises we saw that evening were well worth the heat, humidity and sweat we had to endure! Photographs are important for identification purposes, but I always enjoy the ones taken at eye level that brings to life the individuality of these beautiful moths. This allows the viewer to appreciate and admire their beauty and charisma. 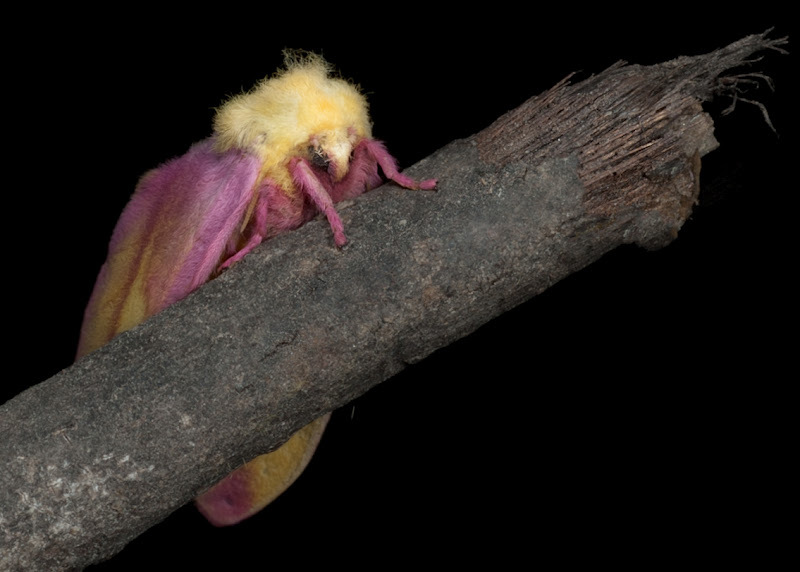 I think a good title for the picture of the Rosy Maple Moth (Dryocampa rubicunda) in the picture below is "Cotton Candy on a Stick"! I really love these fuzzy, colorful guys! Another of my very favorites is the Sphinx Moth. 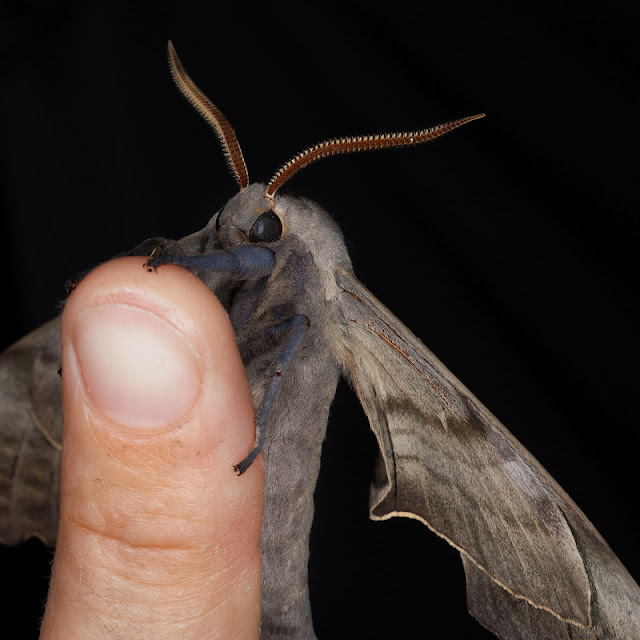 Below are the Blinded Sphinx Moth (Paonias excaecatus) and the Poplar Sphinx Moth (Pachysphinx occidentalis). They are so friendly and will easily allow you to handle them. The Blinded Sphinx Moth has gorgeous colors and the Poplar Sphinx Moth is magnificent in size and character. 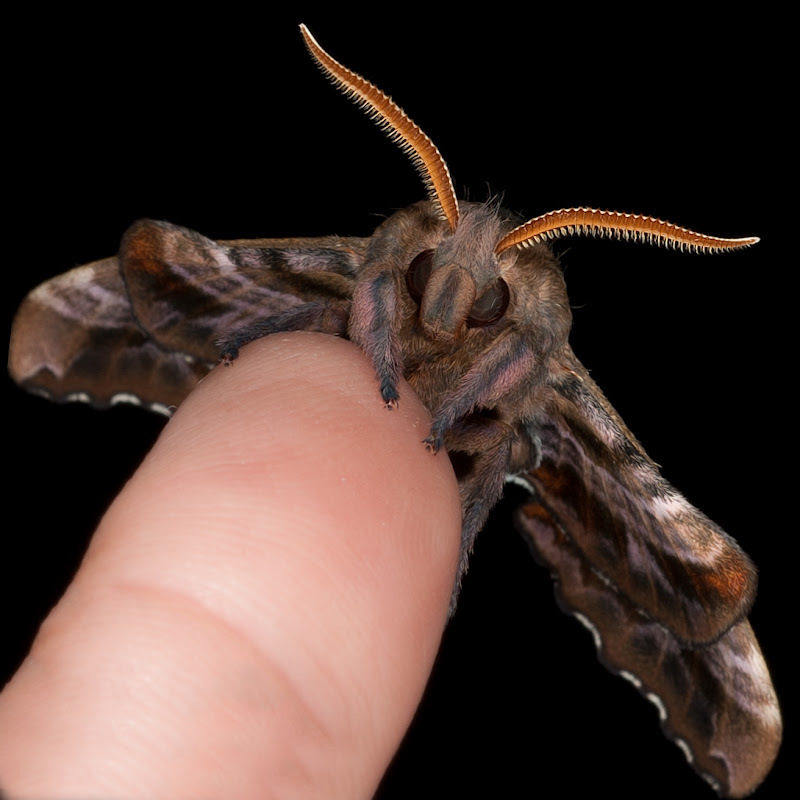 Here is another view of the Blinded Sphinx Moth on the end of my finger. He eagerly climbed aboard! This is the Poplar Sphinx Moth. This was the first time I've had the opportunity to experience this species. I was seduced by him right away! This next little beauty is the Beautiful Wood Nymph Moth (Eudryas grata). Such a unique shape. His coloration and the way he rests on a leaf resembles bird poo. This is a survival tool for this species. Personally, I think he looks like a winged calico cat! There were many more species that graced our presence that night, but these were among my personal favorites. 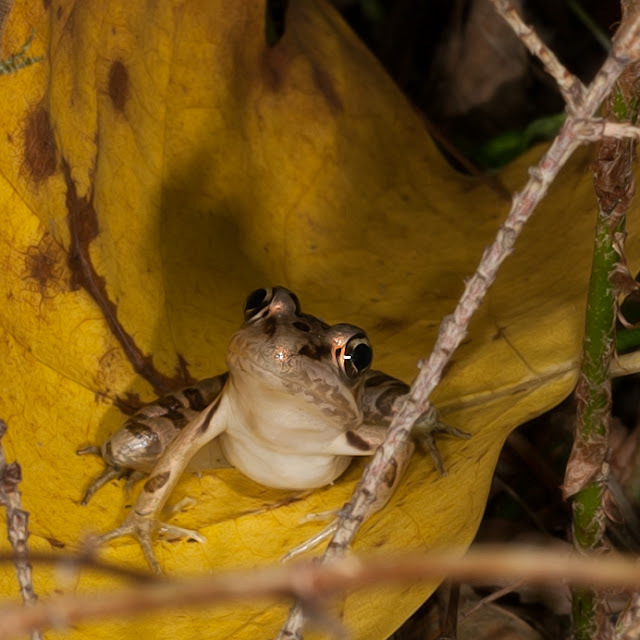 One last surprise that evening was that of a tiny Pickerel Frog (Rana palustris). He seemed to be quietly observing our antics from his poplar leaf. Sure made for a nice picture! 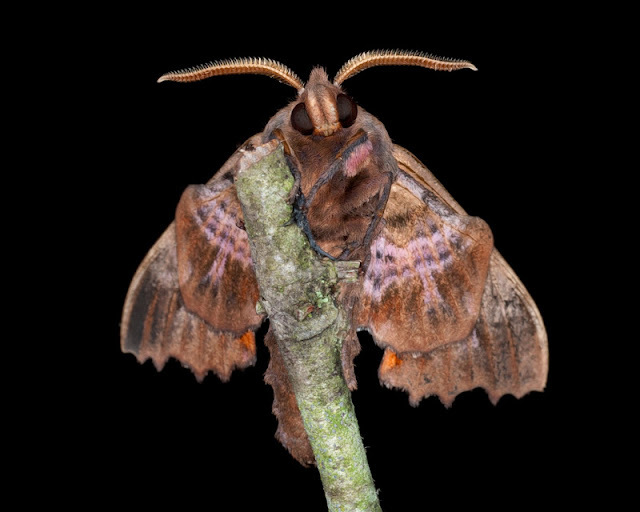 I'm looking forward to attracting, observing, photographing and most of all appreciating more of our huge diversity of moth species, in light of National Moth Week, July 23-29. Two summers ago there was an incredible demonstration that took place right outside my back door involving the biological life cycle of a tiny insect species. This interesting display even included a lesson in phenotypic plasticity. It was a fantastic course in Nature 101. Who were the teachers? 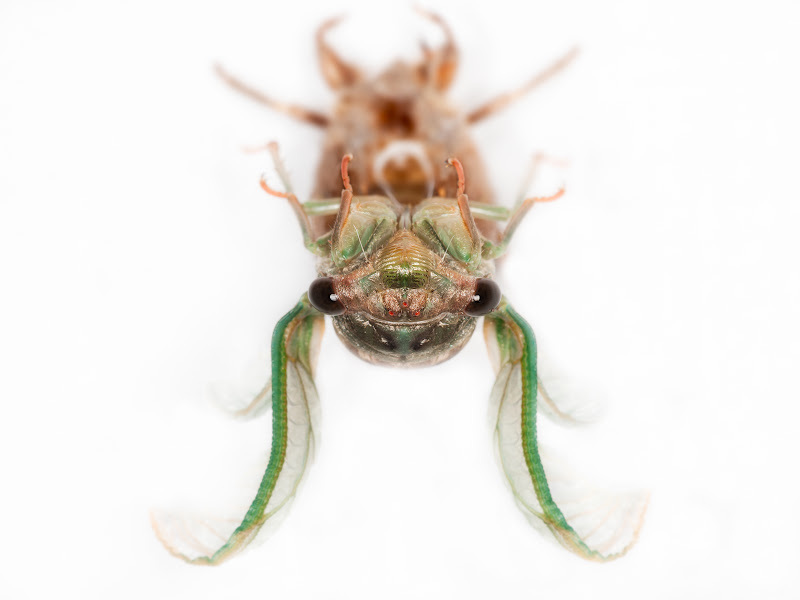 The Aphis nerii. Who was the pupil? That would be me! 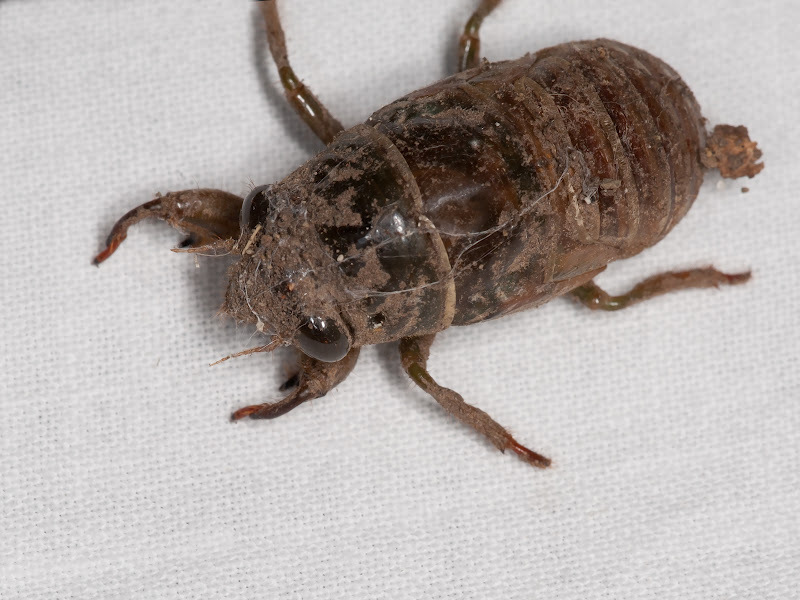 What in the world is Aphis nerii? 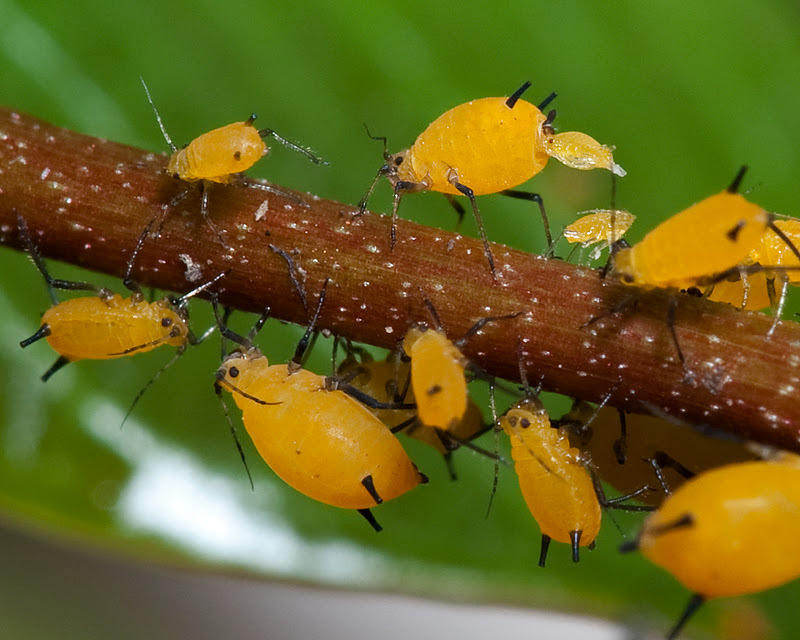 It is the scientific name for a tiny sap-sucking insect, the Oleander Aphid. What in the world is phenotypic plasticity? It is the ability of an organism to change its phenotype, or body form, in response to changes in the environment (more about that later). Yea, I became so fascinated with these tiny creatures that I watched and photographed them every day throughout the entire summer. The picture below is how I first observed the community sucking sap from my flowering vine. 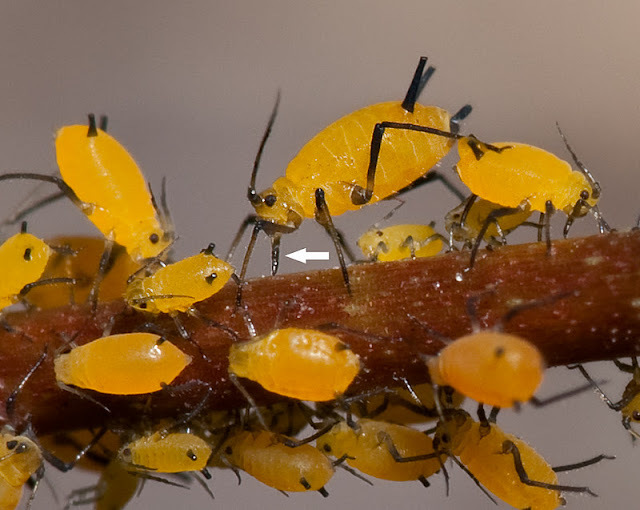 Notice the sharp "stylet" that the aphids utilize to pierce a plant stem in order to access the sap. Safety in numbers is a crucial rule of survival for many species, especially for those micro-sized individuals. 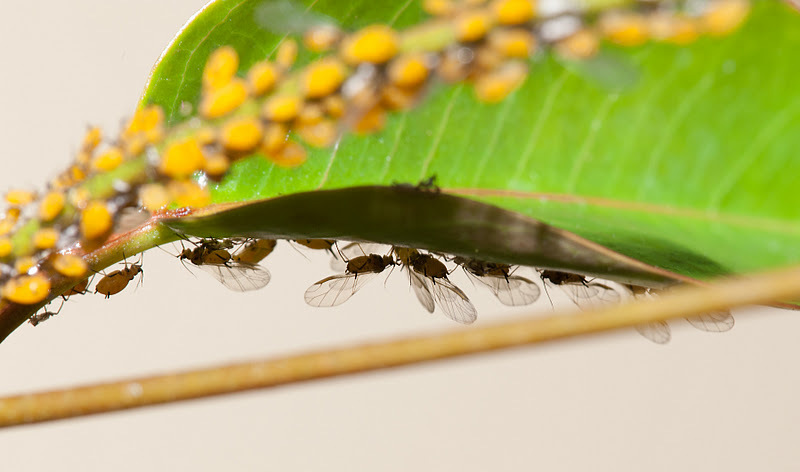 I observed the oleander aphids exhibiting a few intriguing defensive tactics utilizing “team work”. This effort of the entire community is actually quite effective and crucial in order to maintain their existence. One of these strategies is what first drew my eye to them! 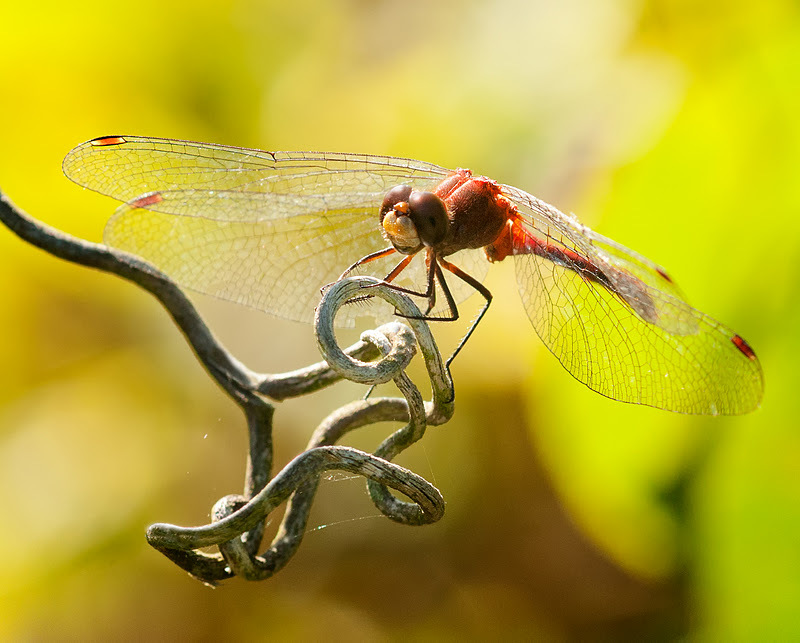 I was watering an ornamental flowering vine when I noticed the tiny, bright orange insects. 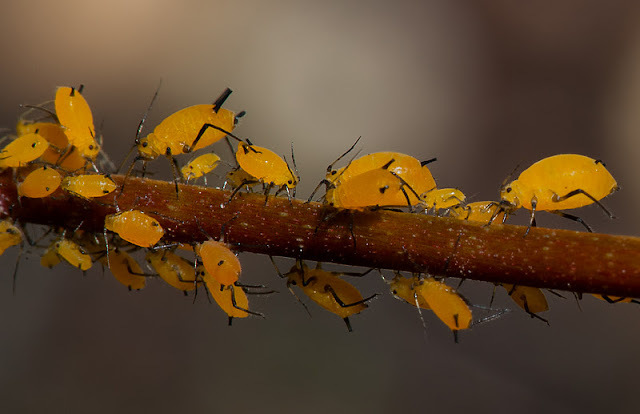 When I leaned over to investigate, the entire colony of aphids would, in perfect harmony, “kick” their tiny black legs up into the air much like a herd of miniscule “bucking broncos”. I was very intrigued with this cooperative behavior and after a little research I learned the very good reason they do this little jig. They get a bit edgy whenever they feel that something is approaching them too closely. 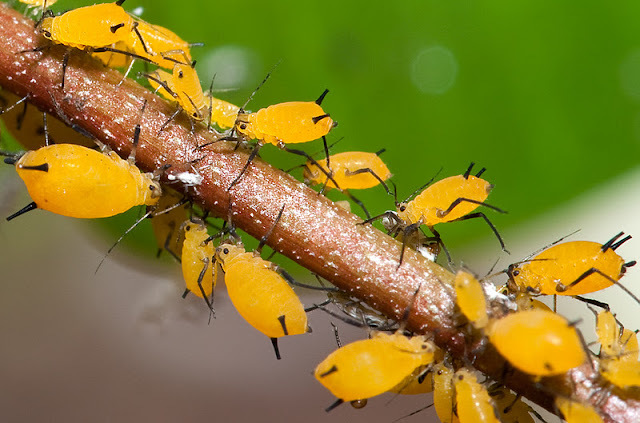 The aphids are especially sensitive due to the danger of an aerial attack from tiny parasitoid wasps that will attempt to oviposit eggs into their soft bodies. The synchronous kicking movements help discourage the wasps from being able to gain access to them. 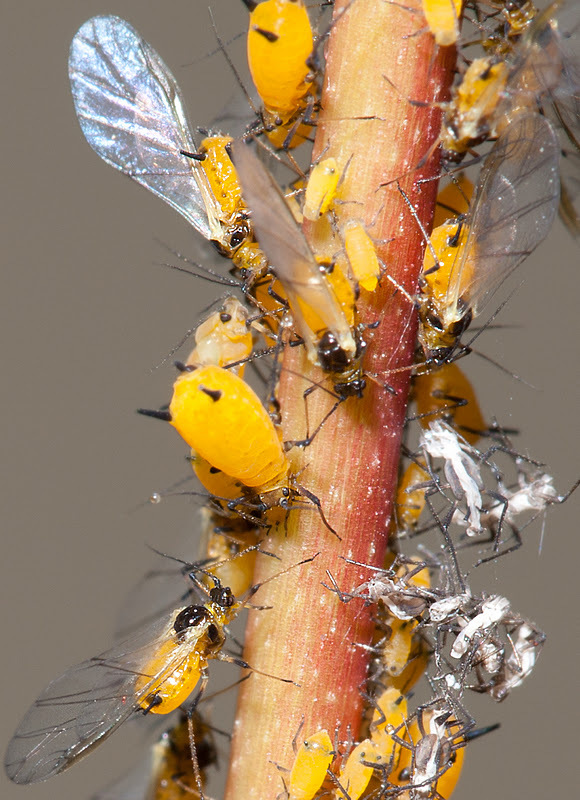 Despite the efforts of the aphids, some of the lucky wasps will eventually find their opportunity to jab an egg into their aphid host. The developing wasp will then eat the aphid from the inside out, and when it dies, it will turn hard and brown like a mummy. 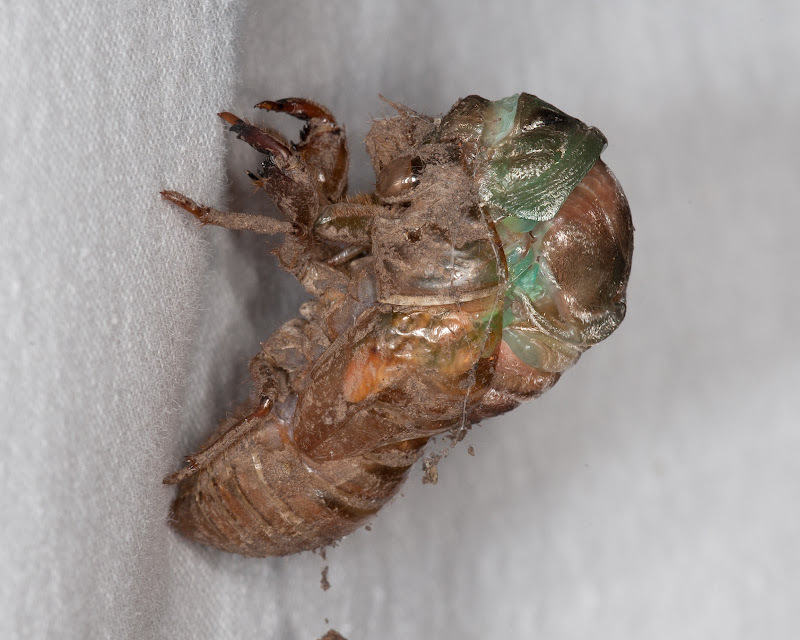 When fully developed, the wasp will simply emerge from the back of the aphid mummy by cutting a hole in its back. When I waved a finger above the aphids, they began their kicking and twitching. This picture shows most of them involved in a full "kick". They do this very forcefully and quickly! The aphids have other tricks up their little black sleeves to help ensure their survival in their volatile environment! 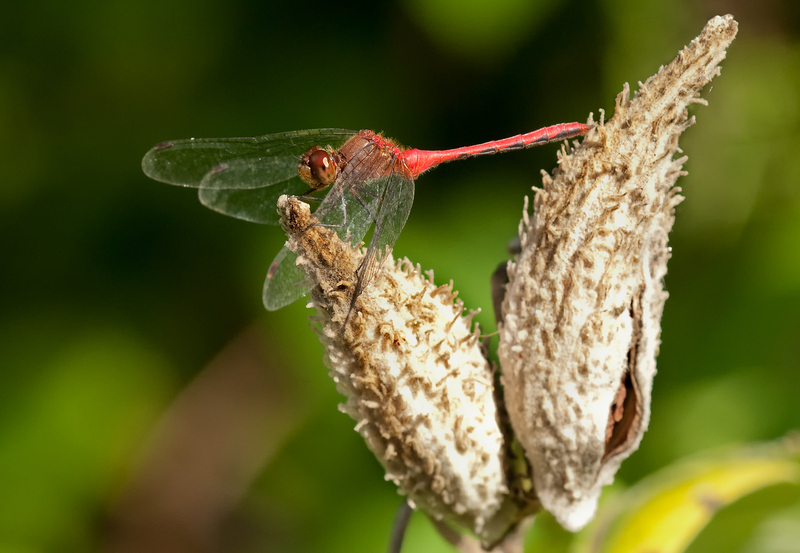 The plants they consume (mainly milkweed and oleander) contain deadly toxins called cardiac cardenolides, which cause them to not only taste disgusting, but to also actually be poisonous to those who prey on them. 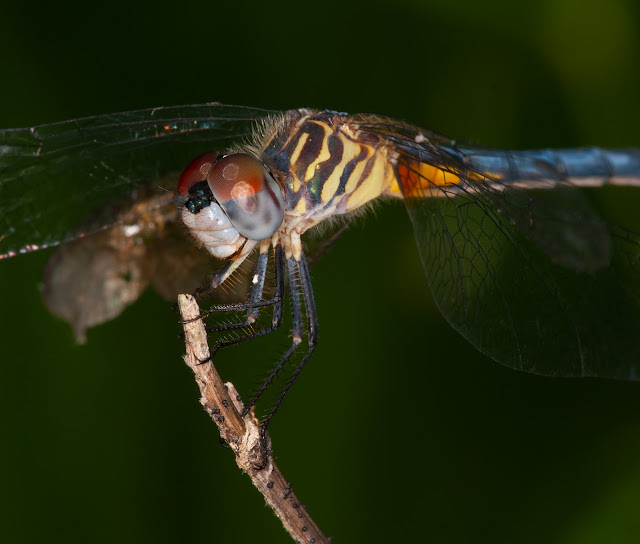 It doesn’t take long for some predators, like birds or spiders, to realize their mistake after tasting one. 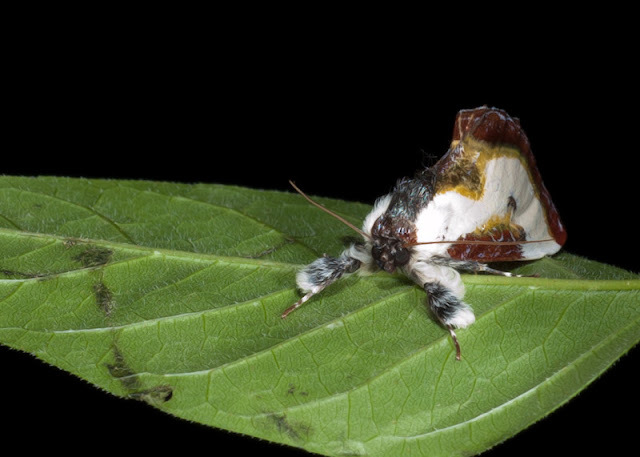 It has even been observed that some species of spiders quickly retreat, washing off their mouthparts after coming into contact with the noxious flesh of the aphis nerii. The toxin can actually kill some predators after consuming one of these aphids, and SHOULD the predator survive, it may display problems later on. 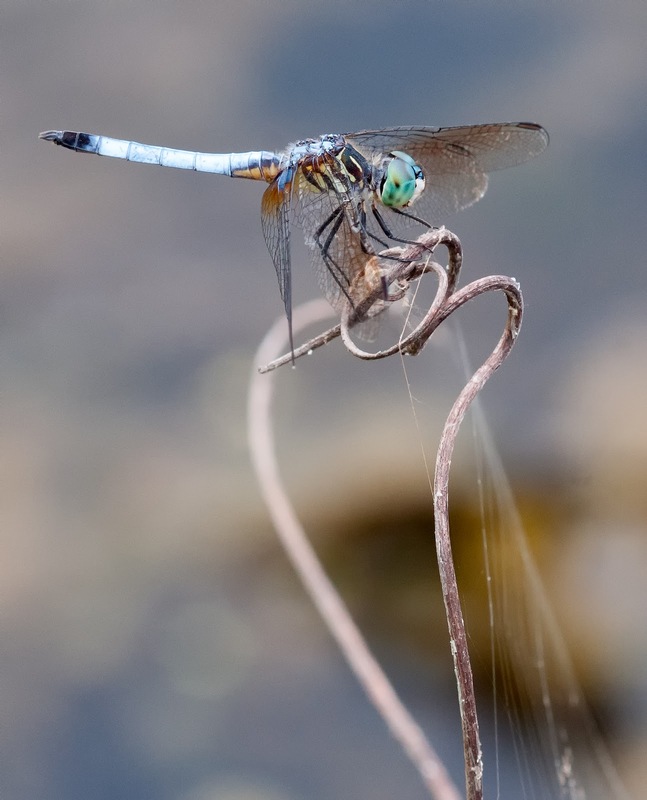 It has been noted that the ingested poison may cause some spiders to weave disfigured webs, which results in the inability to capture food, resulting in a lower survival rate. Ladybugs (another known predator) may develop wing deformities, resulting in a decreased ability to find food or to reproduce. I guess this is an attempt for the aphid species to reduce the population of potential predators. 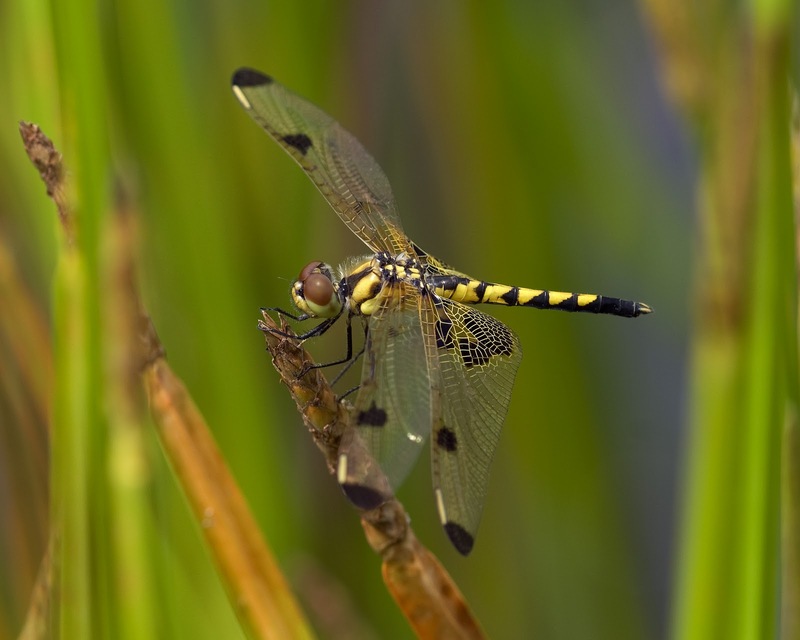 Any insect or bird searching for a meal should heed their bright yellow/orange coloration; in fact most species of the natural world instinctively know that this color is a warning! 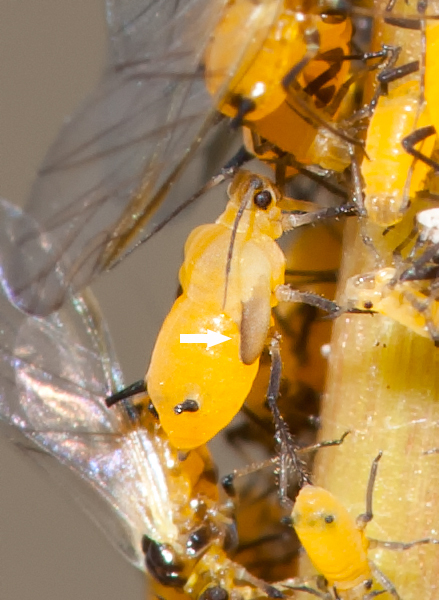 The arrows below indicate droplets of the poisonous cardenolides being expelled through the tube-like cornicles located on the aphids' abdomens. This happens when they are threatened or aggravated. I observed this behavior quite frequently. 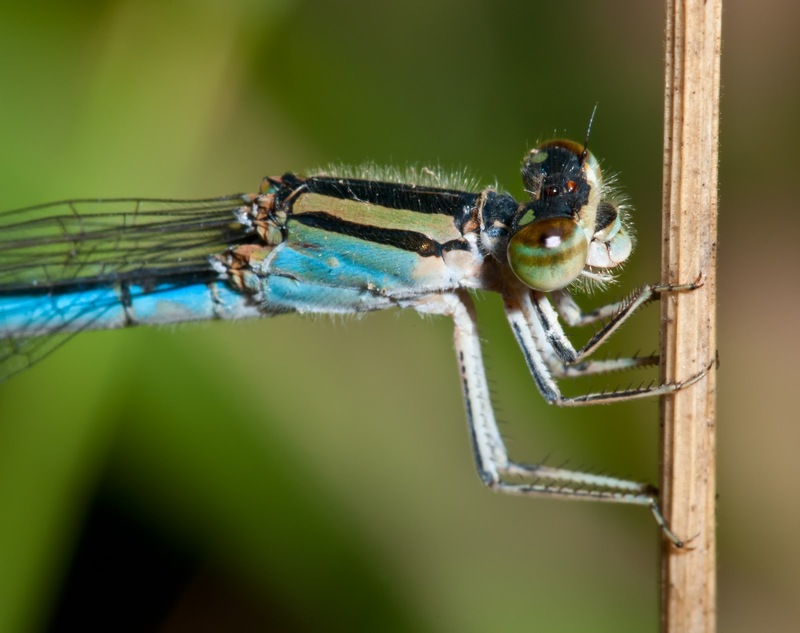 As the days passed by, I noticed that their numbers were increasing very rapidly, and it was no wonder... a closer look revealed they were giving birth to live young! Due to their incredibly small size, I was only able to witness this event through my 200mm macro lens. 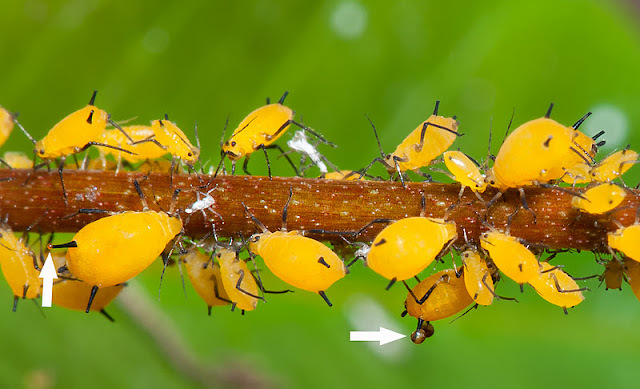 This is where things really get bizarre...these aphids are thought to be parthetogenetic, which means the adults are all female and reproduce without males (in fact males are thought to be absolutely non-existent in the wild). The females give birth to live young, which are perfect clones of themselves, and believe it or not, the newly emerged nymph already has an exact clone inside of her, which has an exact clone inside of her! These “telescopic generations” are not only nature’s ingenious way to ensure a rapid increase in their population, but it also quickly passes on the genetics needed to survive in the particular environment they are living in. 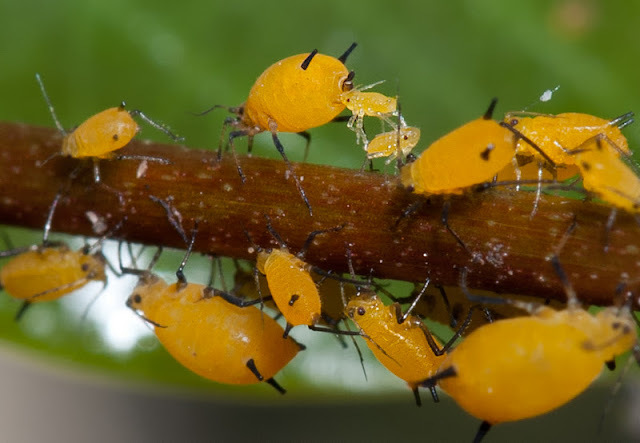 The picture below shows the aphids beginning to give birth to live young! It was an exciting event! The picture below show how much the daughters look like the mother. The aphids are extremely environmentally sensitive. 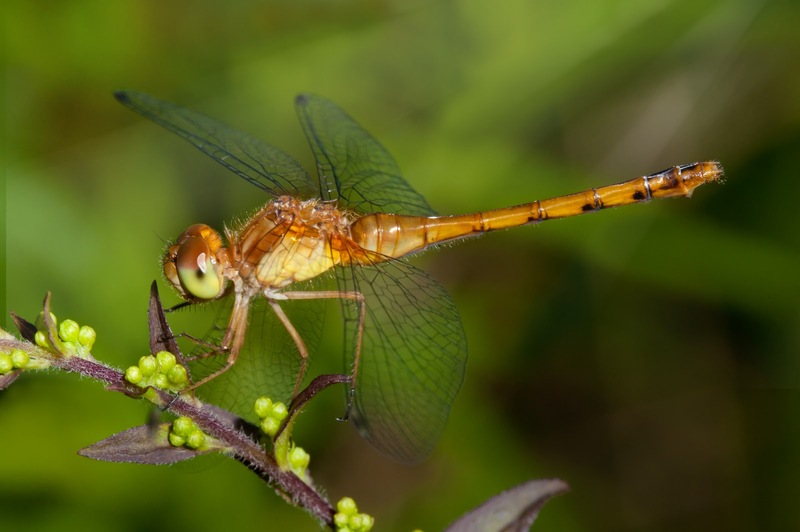 Interestingly, at first the young are un-winged, but they have the amazing ability to change their body form based on changing conditions within their environment. 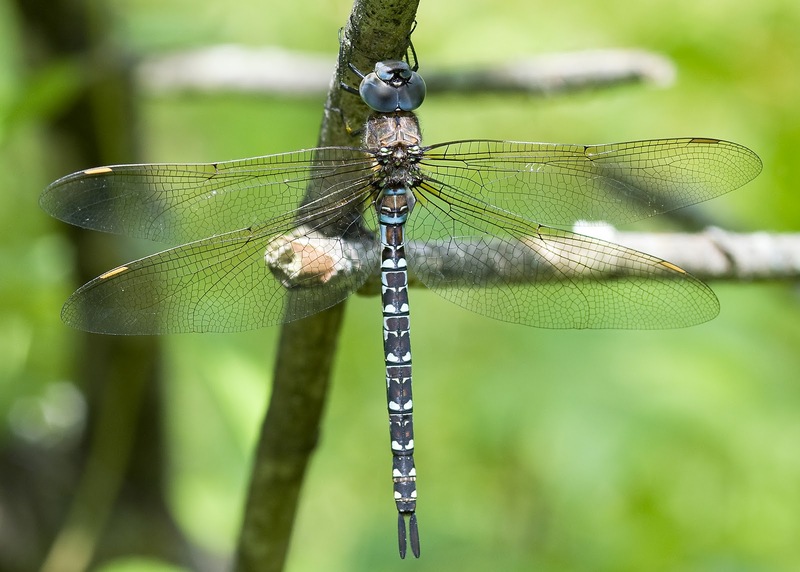 Overcrowding, decreased temperatures, decreased food sources or the increase in presence of natural enemies are factors that will cause this transformation. 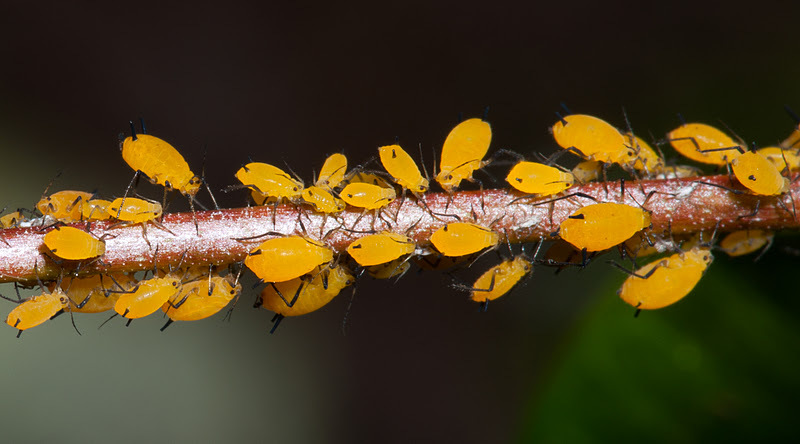 For example, when a colony reproduces to the point where their food supply becomes scarce, winged aphids will start to appear. This remarkable alteration further increases their chance of survival by allowing them to relocate where they can continue to feed, reproduce and recolonize. 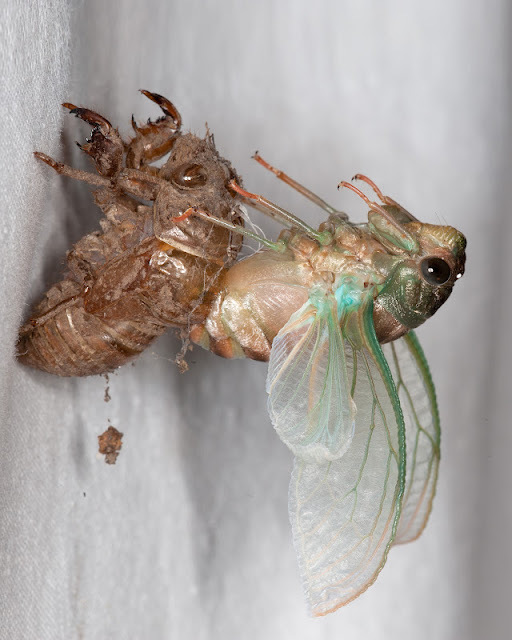 In addition, extremely detrimental conditions can also cause changes within the mothers and they begin giving birth to daughters who will now be winged. These characteristics are adaptations that allow a species to better adapt to its environment to aid in “survival of the species”. I witnessed this exact scenario as soon as the population exploded to the point that they were becoming overcrowded. 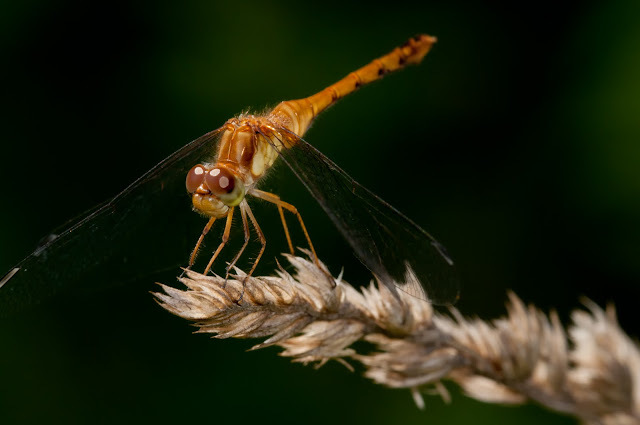 I was amazed at how many winged aphids began appearing all of a sudden, and even more appeared when the temperatures started to decline in the evenings. You can see here how crowded things are becoming on the vine in the foreground. The background displays the transformation that has occurred because of that situation. They will now be able to relocate to a fresh food source. The arrow below shows the "wing buds" starting to form. The white objects in the picture below are the skins that were shed during molting as the aphid nymphs were growing and developing. I read that the aphids may pile the molted skins up (as pictured), forming an infrastructure to serve as added protection from predation. I've also pointed out a dead, "mummified" aphid that fell victim to a parasitoid wasp. Below, it is evident how the body style differs between the winged aphids and the un-winged. The winged ones need to be successful at flight, so they are much lighter and thinner. That summer, what began as a small group of aphids, grew to immense proportions in just a couple of months! My vine literally had thousands of them covering the branches and new shoots. 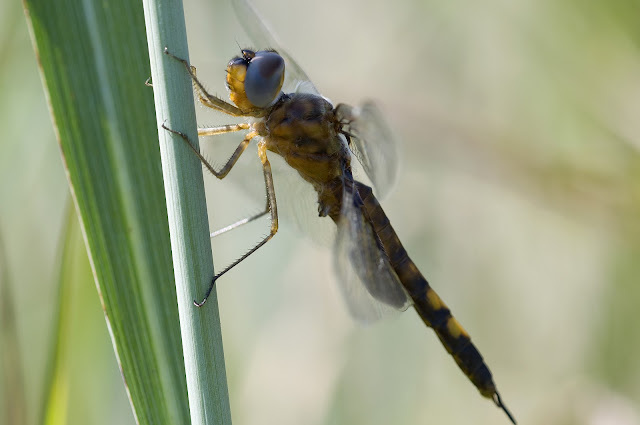 Then as summer ended and the temperatures dropped, so did the their populations. 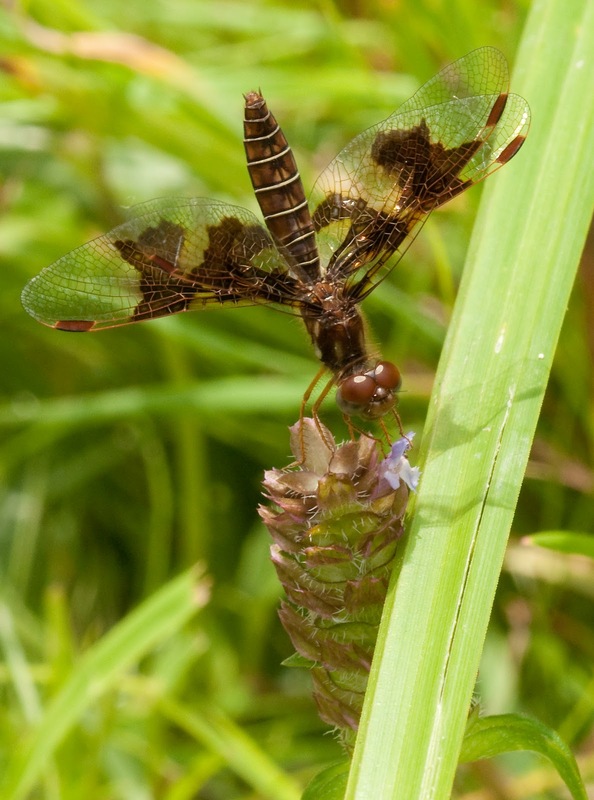 Most likely a large portion of the winged aphids were dispersed by the wind, passively bound for warmer regions. They can migrate great distances, and that is probably how they first ended up here, since they do not overwinter, or begin as eggs. 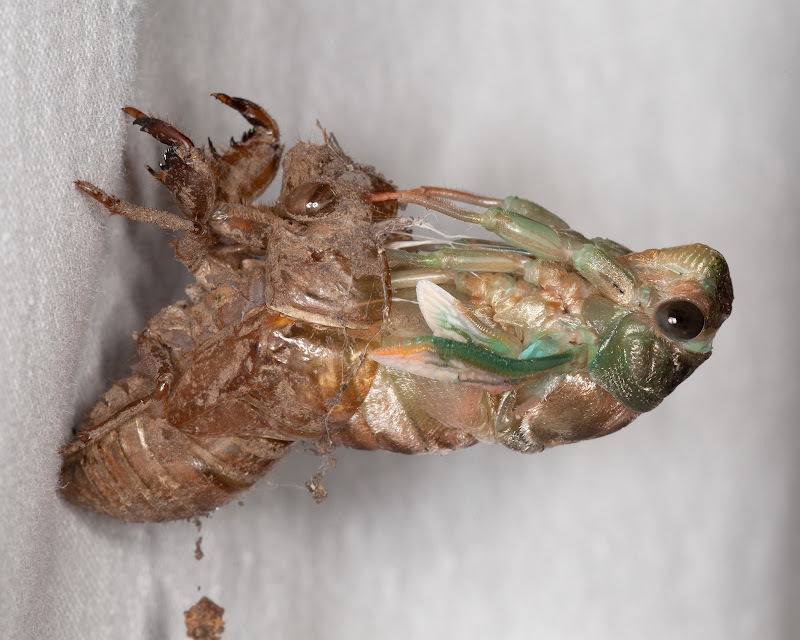 The remaining un-winged aphids succumbed to extinction by freezing to death and dropping to the ground. I was actually sorry to see them perish. Last summer I looked forward to once again being able to observe their complex life cycle, but there were very few aphids visible on my vine. I guess there are a lot of atmospheric variables that affect the dispersal of insects, and last year just wasn’t as favorable as the previous year. Even though aphids are a well-established invasive species that can cause massive damage to the plants they feed on, I felt their establishment on my flowering vine was an enlightening experience and a wonderful glimpse into an incredible world where survival is the name of the game. One can learn so much about life by observing even the smallest of organisms! I feel fortunate to have been able to witness this incredible journey through the lens of my camera. Dragonflies completely bedazzle me! Regardless of what I'm doing, or what my photographic focus is at the moment, once I spot that familiar burst of speed in my peripheral vision, the chase is on as if I'm spellbound! 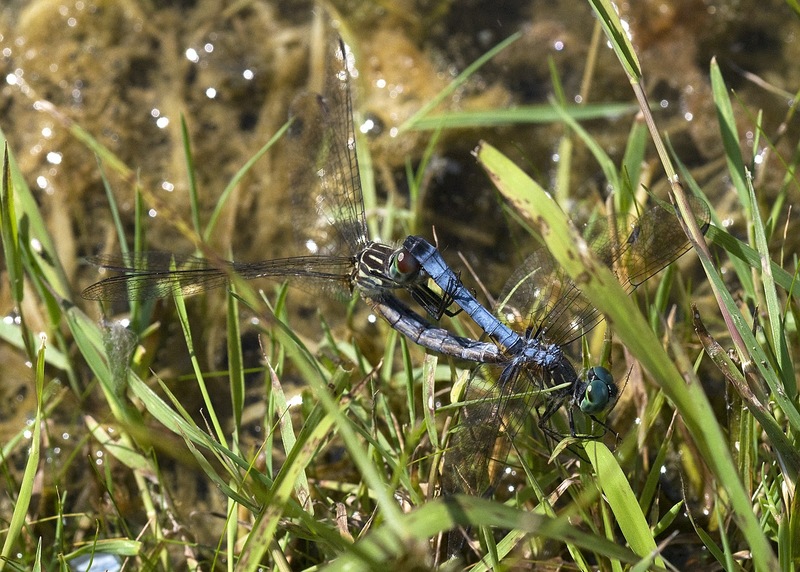 It is such a challenge to keep your eyes on these "Speedy Gonzaleses", and once they land it is always exciting to see what species they may be. I've always been captivated and inspired by these beautiful, interesting creatures. 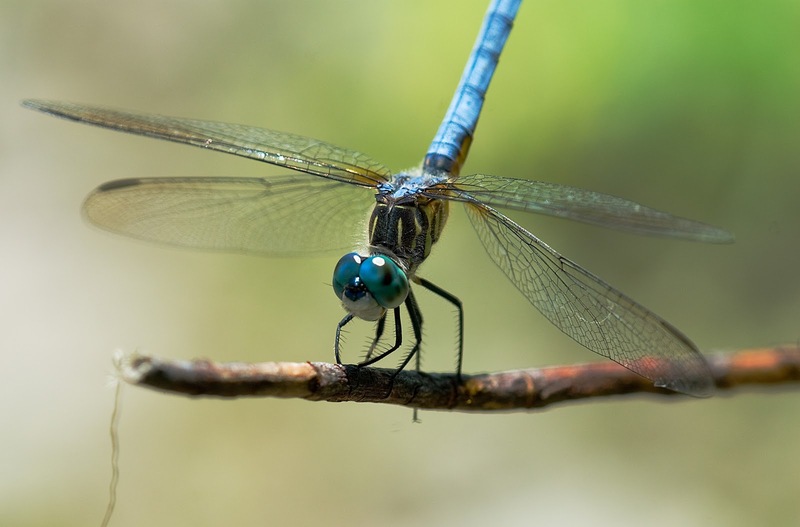 The dragonfly's amazing agility is one of its most profound characteristics. 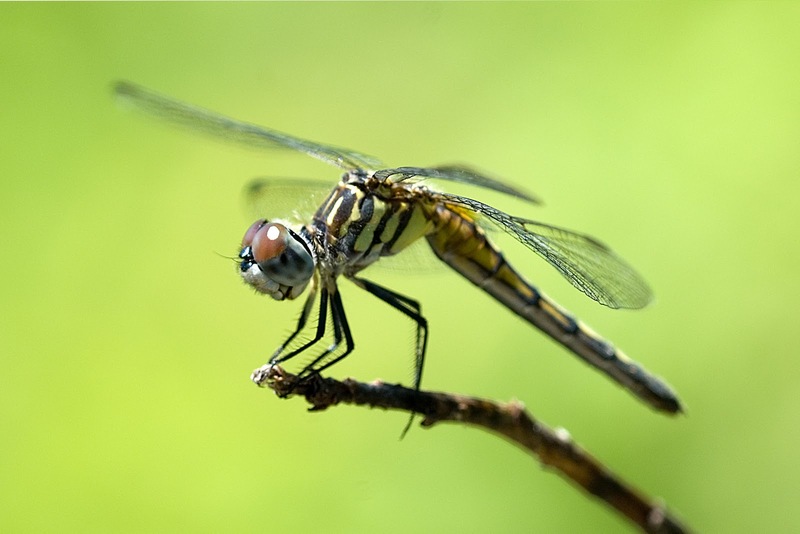 Their maneuverability is as precise and skilled as that of an elite jet fighter pilot. 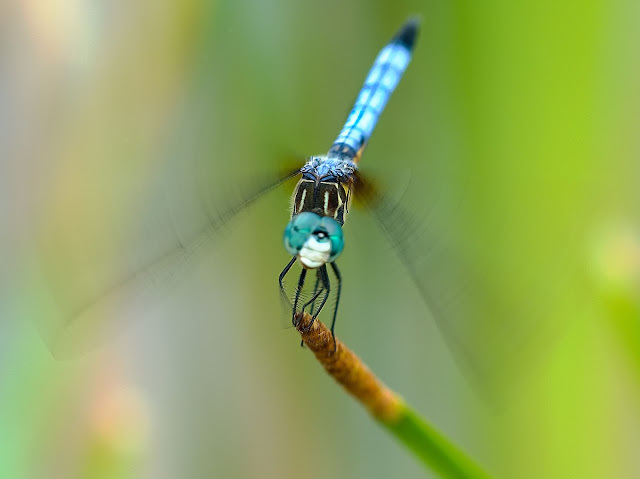 I am in awe of how they can obtain incredible speeds, then abruptly turn or hover in mid-air as if carrying out a mission. It is a joy to watch as they patrol their domain, relentlessly chasing other species who dare invade their space. Even though they will fight other dragonflies to their death, and are voracious predators, they are also extremely delicate, gorgeous and can be downright charming! They are truly and literally a work of art! Their colors and patterns are exquisite. 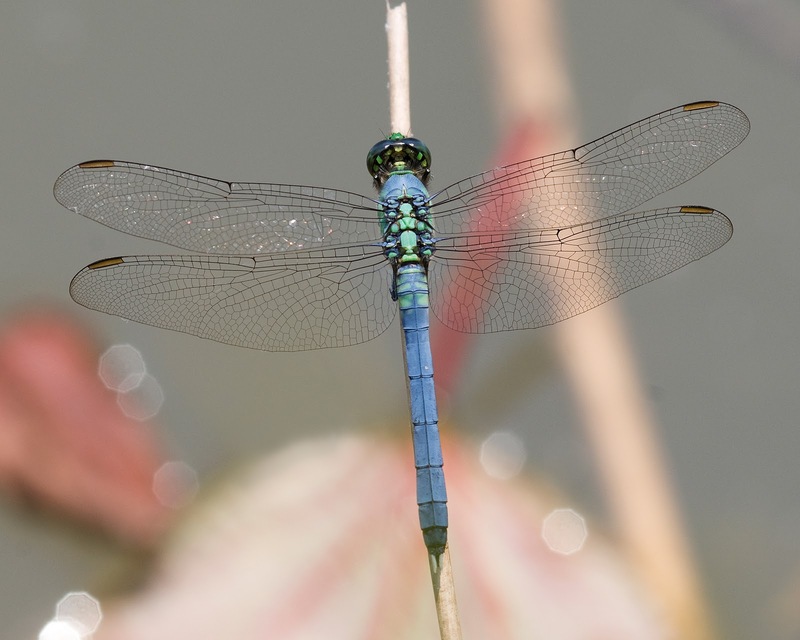 Their relationship with light is a poetic one, as their fragile wings display an ethereal iridescence while the bold, beautiful colors of their bodies shimmer like jewels in the sun. 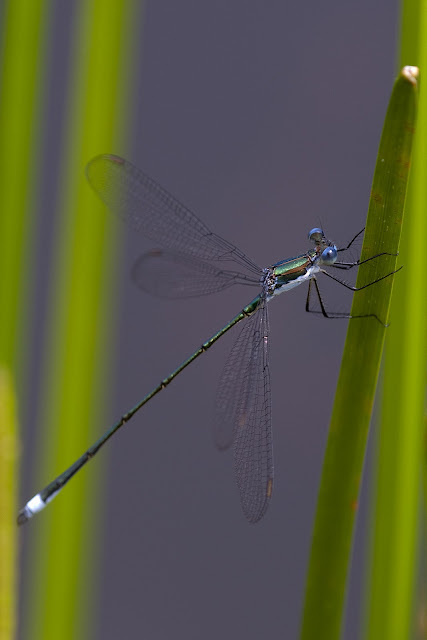 It is no wonder they are regarded as mystical and symbolic by so many cultures. Dragonflies begin their life in an aquatic world, then take to the air when they reach maturity. 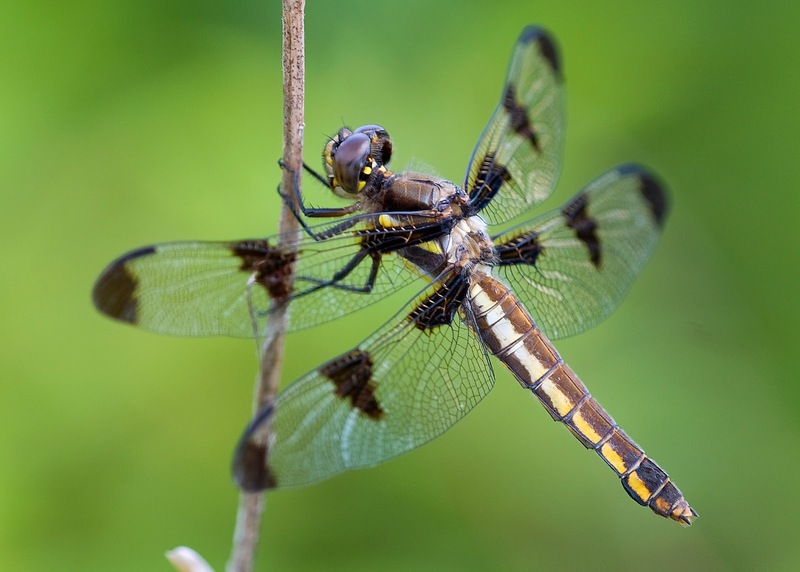 They are very beneficial and contribute to the delicate balance of the ecosystem by consuming thousands of mosquitoes and other insects. Everything about them is fascinating, including their breeding habits. As I've observed and photographed dragonflies and damselflies, I've noticed that different species seem to have their own personalities. 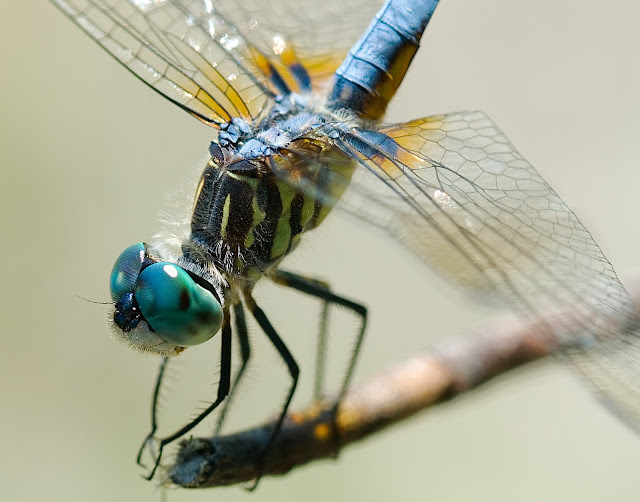 The one pictured above, the Blue Dasher, is very charismatic and curious. This particular species seems to lock eyes with you, watching you intently as if amused by your presence, while simultaneously scanning the periphery for a quick snack. They do this comical little move where they jerk their heads very quickly, which makes for some funny pictures if you catch just the right angle. The Blue Dasher seems to love your company and will remain very close, occasionally darting about to catch insects, but returning to the same perch over and over within a few seconds. Other species can be more aloof, and lead you around for hours as if enjoying some kind of game of aerial hide and seek! 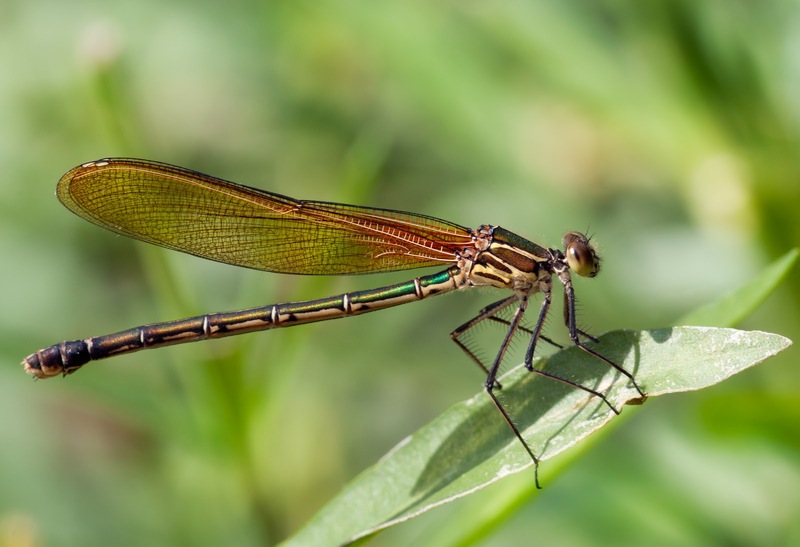 There is nothing more therapeutic than relaxing along a pond or stream on a warm afternoon, watching the graceful acrobatics of a dazzle of dragonflies, and listening to the sound of their wings as they skim over the sparkling surface of the water. Just the memory makes me long for spring! 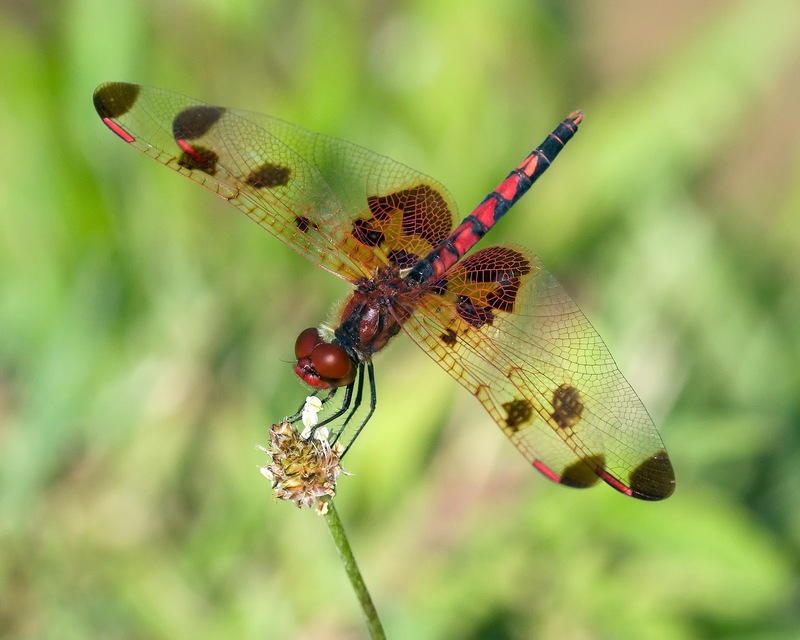 The Variegated Meadowhawk. 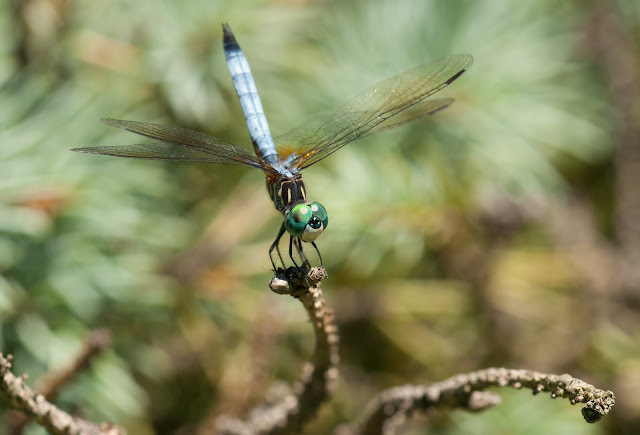 I found this dragonfly while visiting my daughter in Oregon. I believe this to be the Clamp-tipped Emerald. Found him patrolling a drainage ditch along an old forestry road on top of a mountain in West Virginia. 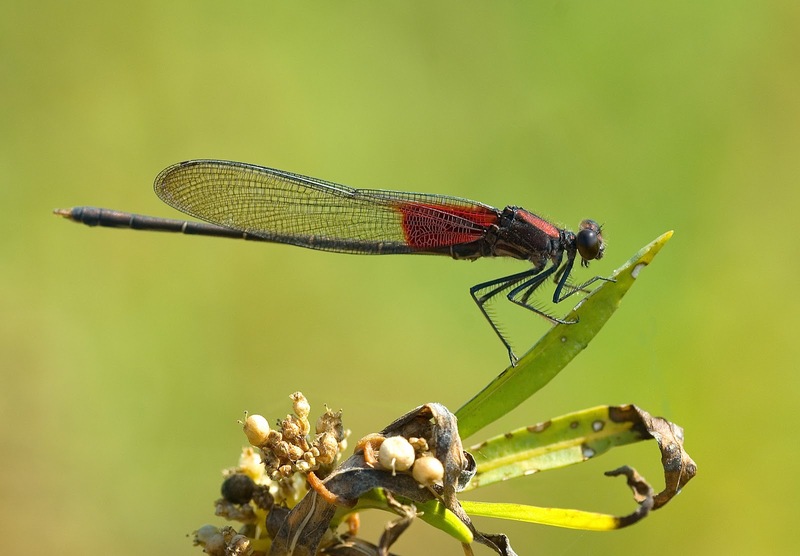 My husband and I set up our collapsible stools in the ditch and watched him diligently flying back and forth along that narrow ditch. He finally didn't seem to mind us anymore and would land right beside us! What a fun afternoon, and what a real beauty! Spectacular eyes! 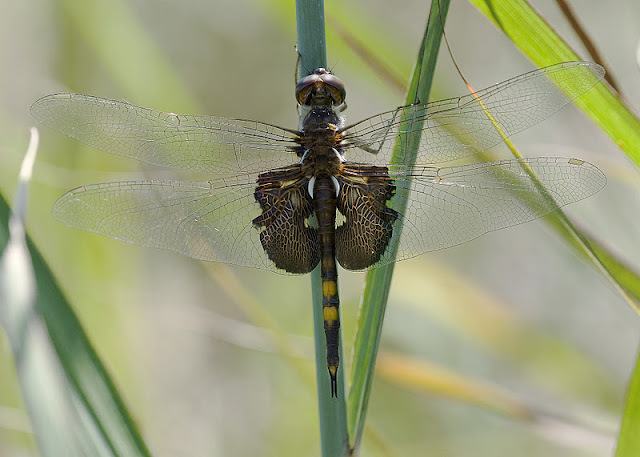 Female Twelve-Spotted Skimmer. 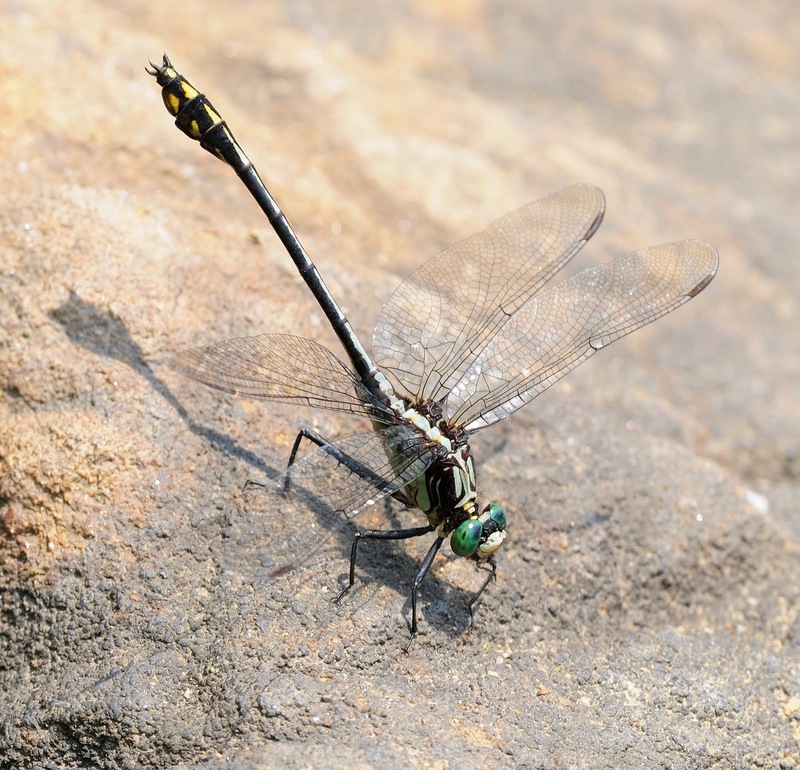 The male is similar, but has a white spot in between each black spot. 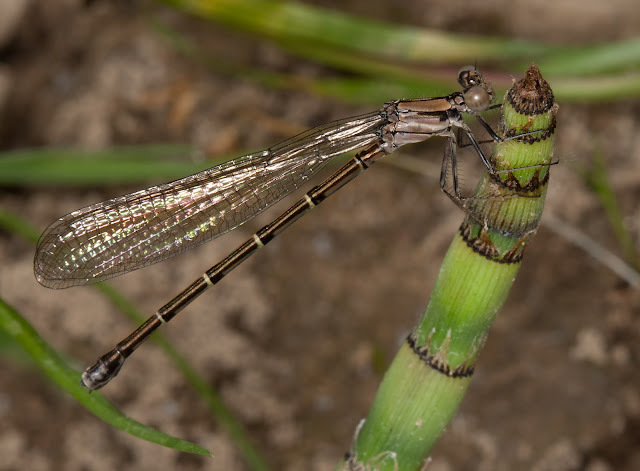 Spreadwing Damselfly (unknown species) Some of these tiny damselflies literally shimmer and sparkle! Possible Black-shouldered Spiny Leg. I've only seen one of these. 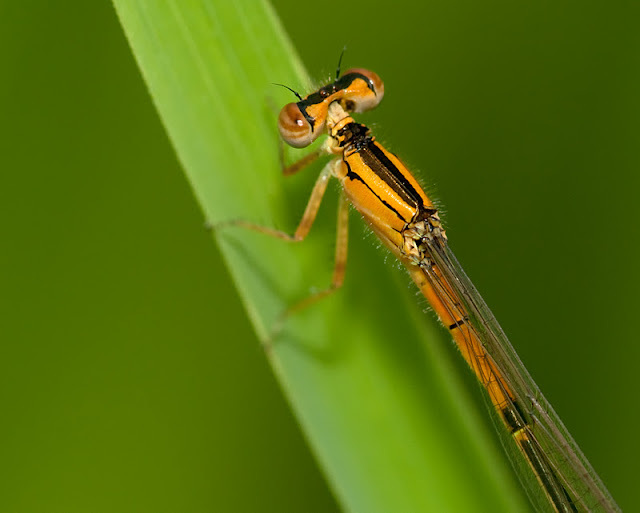 Damselfly (unknown species). 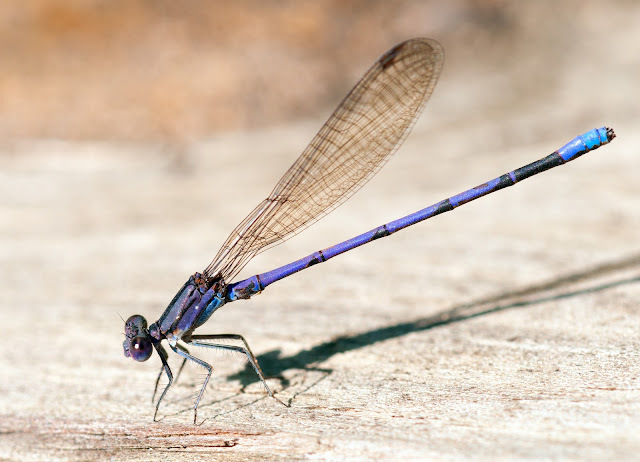 I think these subtle colored damselflies are just as beautiful as the brighter ones. It is amazing how well they blend in. Female American Rubyspot Damselfly. She reflects the colors of her surroundings so much better than the male. They are both very stunning and fun to watch. Male American Rubyspot Damselfly. The Rubyspots really love moving water like rivers and streams. 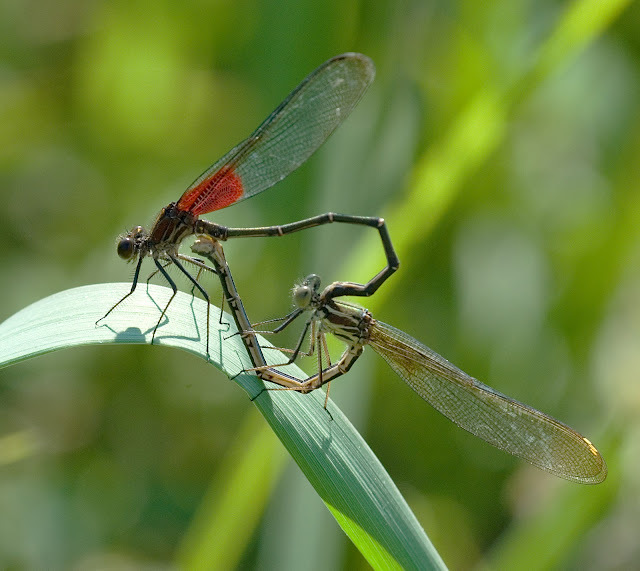 Male and female American Rubyspot, mating. I love they way damselflies eventually form a heart while mating. 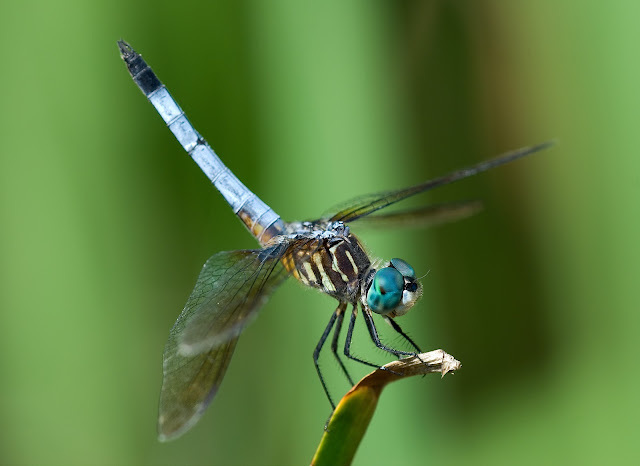 Male Blue Dasher. Sure does appear that he is laughing! Male Halloween Pennant. His coloring is perfect for his name. 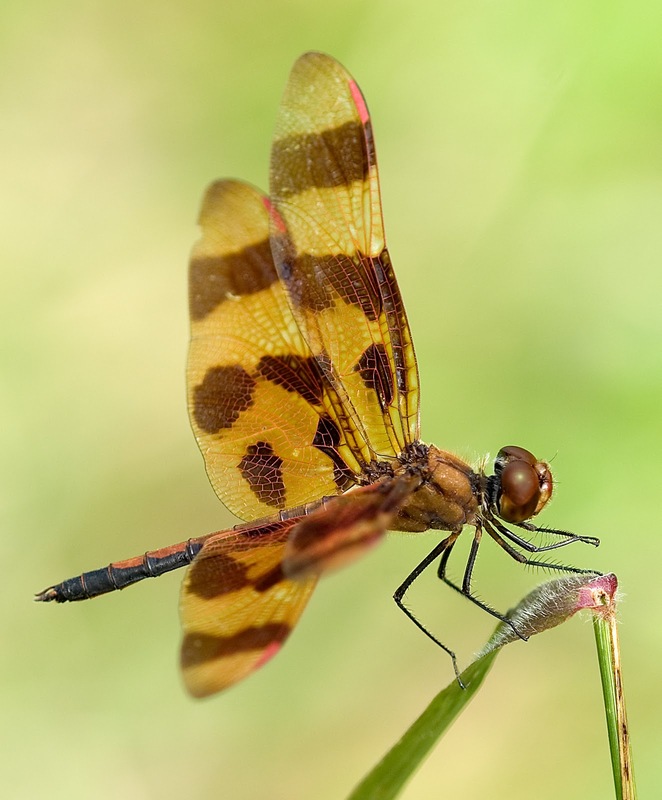 Male Calico Pennant (notice the little "hearts" along his abdomen). 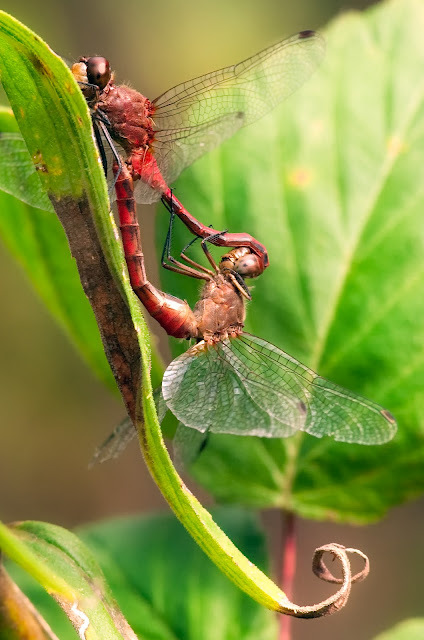 Male and female Ruby Meadowhawks, mating. 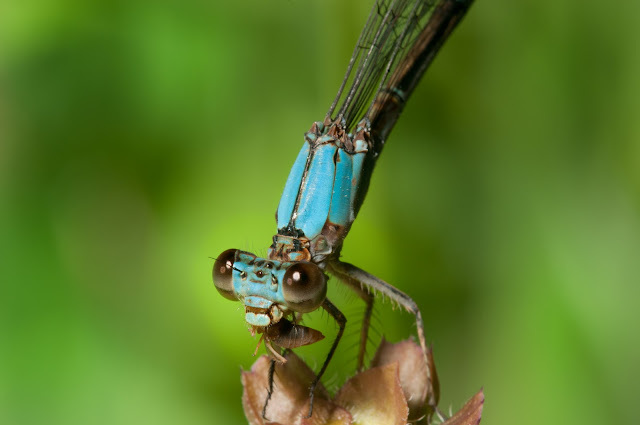 Same Damselfly as above, finishing up an insect he just caught. 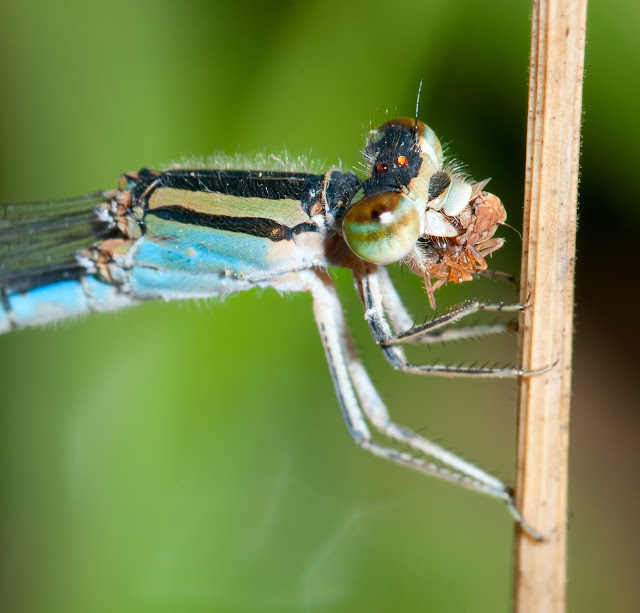 Damselfly eating an insect (unknown species). 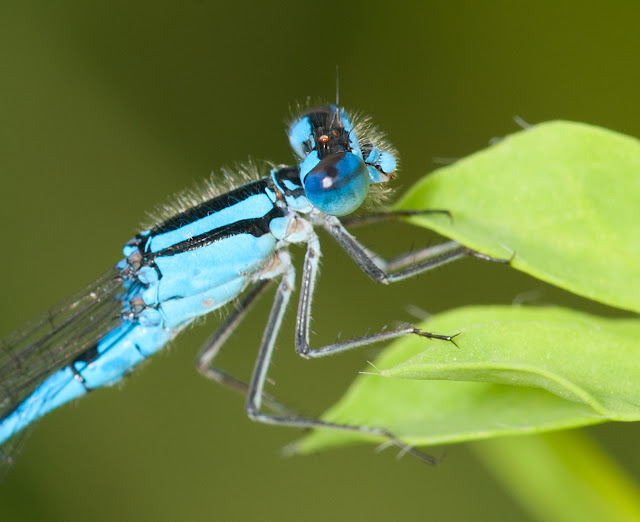 You would be amazed at how lightening fast a damselfly or dragonfly can grab an insect out of the air. You would also be amazed at the audible crunching sound as it is consumed! Same Damselfly as the photo above. 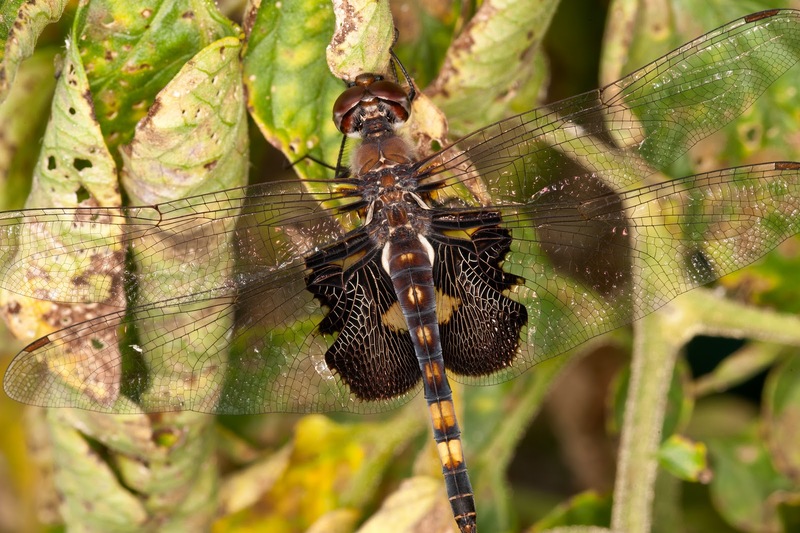 Uhler's Sundragon (This one is a rare find-it is on the Endangered list for Ohio!) I found this one while mushroom hunting in the woods early one spring morning. I was surprised to see a dragonfly in this particular area. I will be looking again as soon as the time is right, and maybe I'll get lucky again! 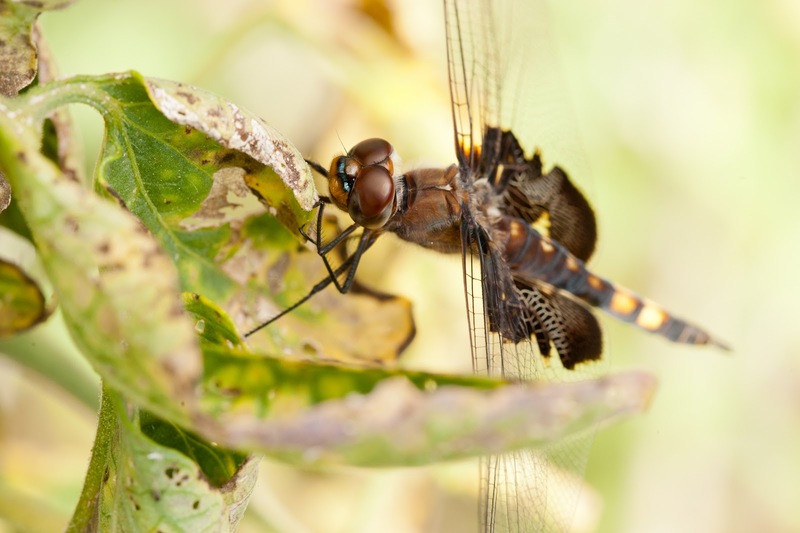 Female Black Saddlebag. 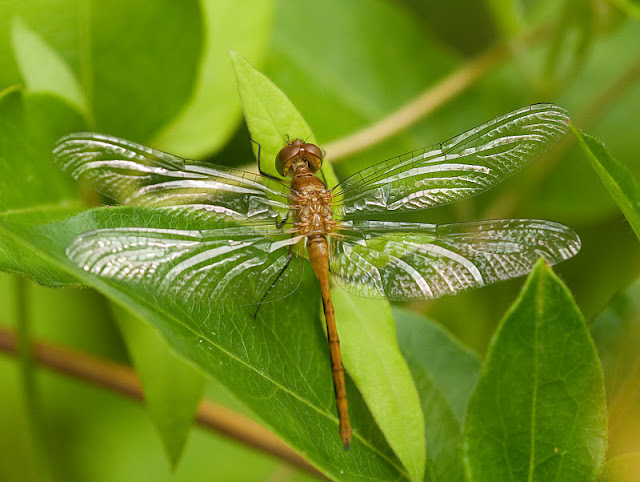 This species is a very fast patrolling dragonfly that seems to fly non-stop. 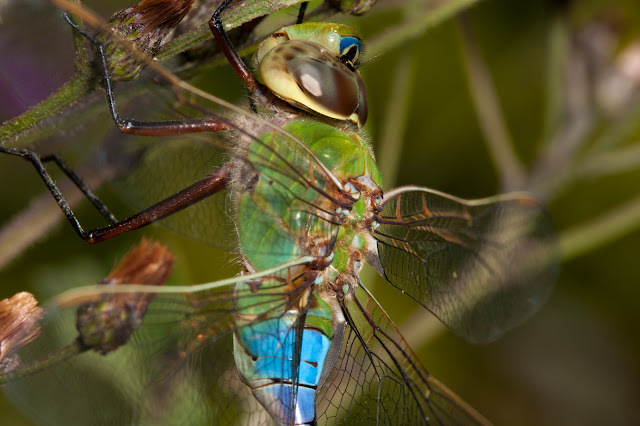 They usually do not tolerate a close approach, so I feel fortunate to have gotten a few shots of her as she was warming her wings in the sun on a cool morning. There is also a Red Saddlebag that is very bright and beautiful, but I've yet to get a picture because they are always in constant motion! Close-up of the incredible texture and details of the wings! I always love to get shots looking right into the eyes! 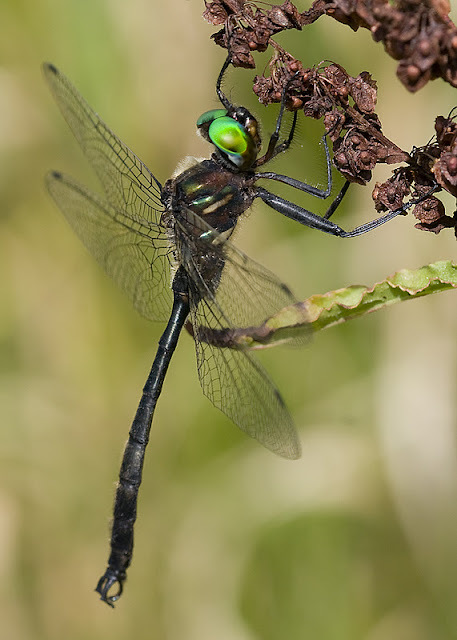 This is the same Black Saddlebag pictures right above. Love the play of light and color! 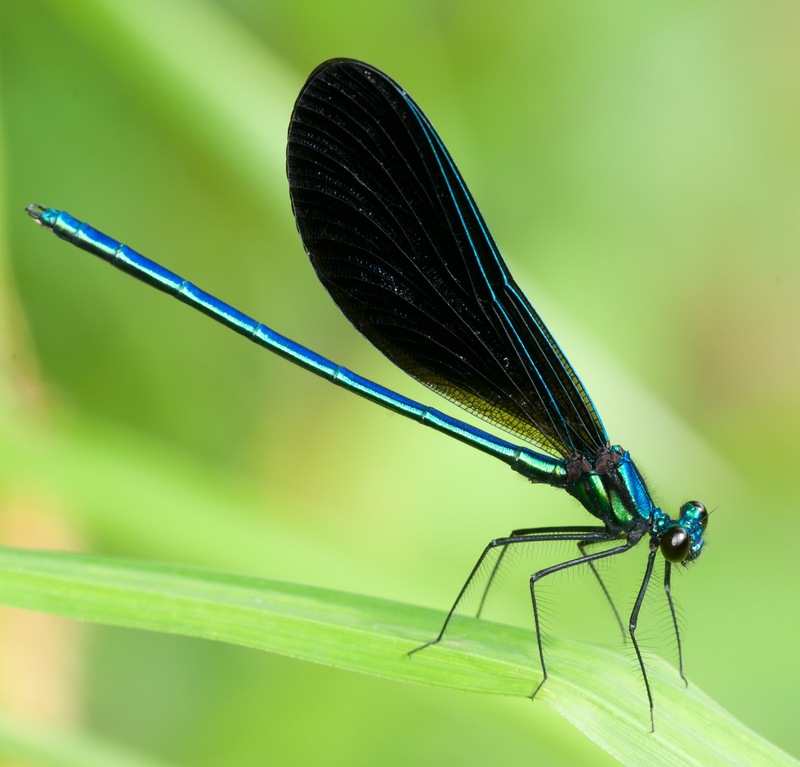 Male Ebony Jewelwing Damselfly. 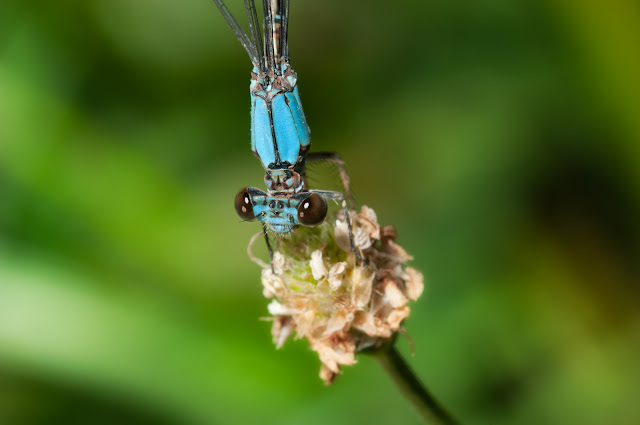 You can find lots of these guys amongst the foliage that line streams. 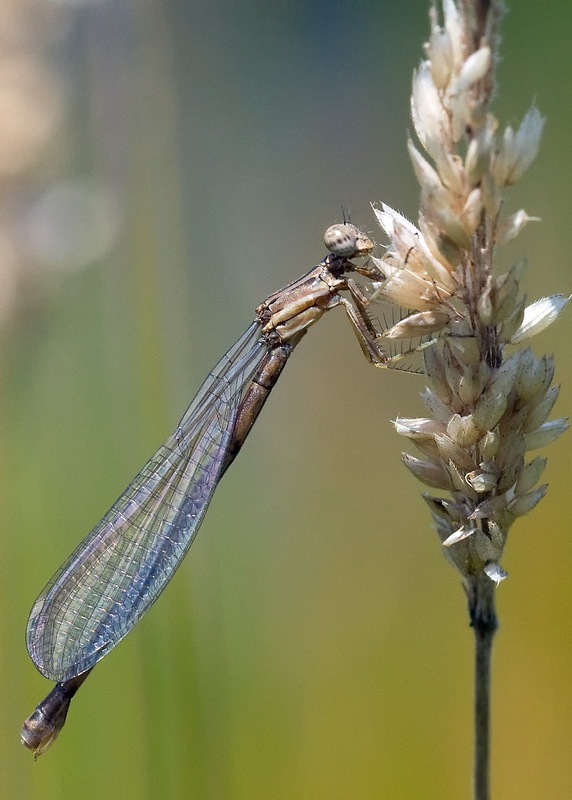 They have a very beautiful, dainty flight pattern, somewhat different than other damselflies. The metallic appearance really catches your eye. This beautiful, large dragonfly is the Spatterdock Darner. My husband took this picture-I walked right past him because of his camouflage. The perfect symmetrical markings make this dragonfly look like a hand-painted tree ornament! Female Eastern Amberwing. 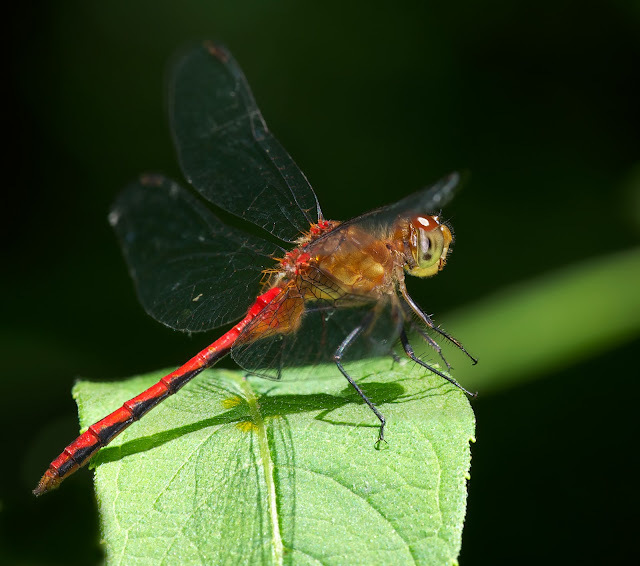 This is a very small dragonfly that I've seen in large numbers at the edge of ponds. 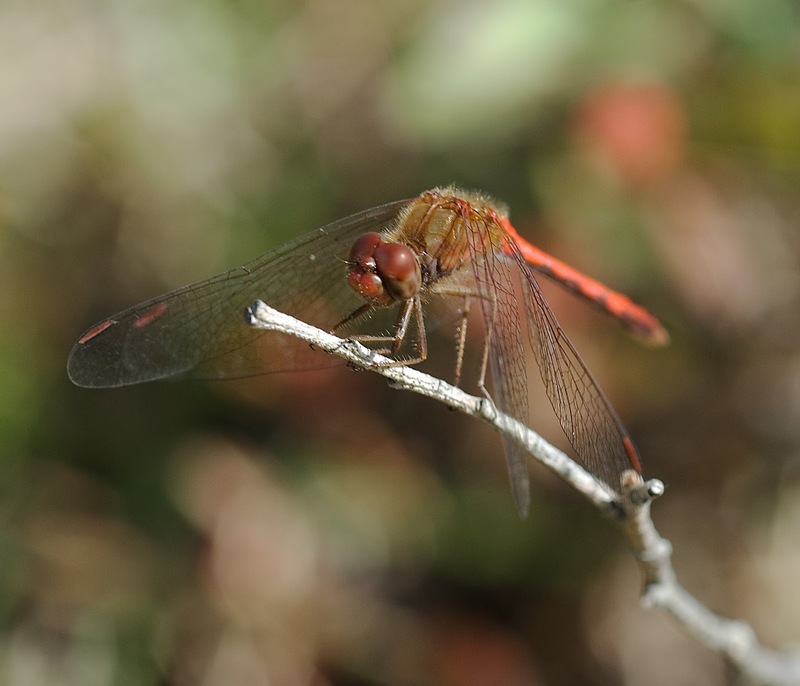 The male of this species has beautiful, bright amber/orangy wings. Unicorn Clubtail. 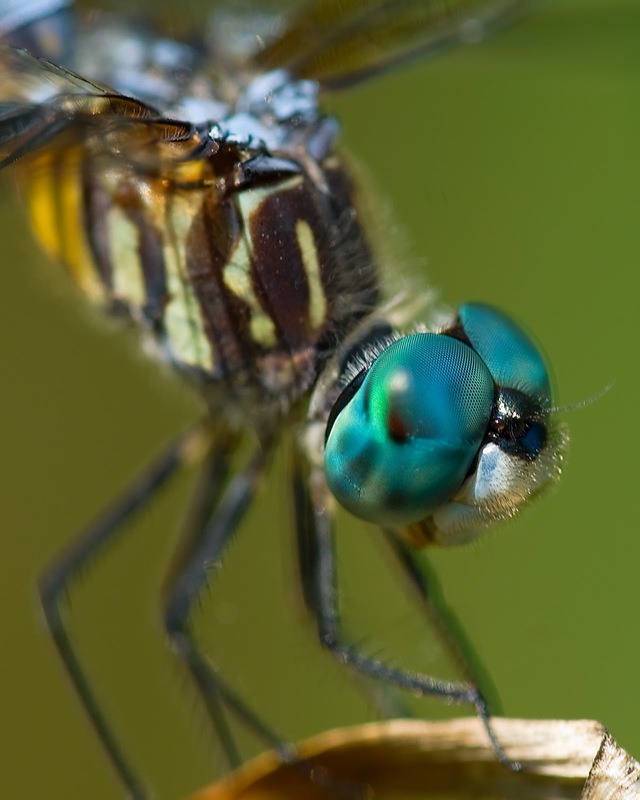 I love this dragonfly-he will let you approach fairly closely without fear. He gets his name from a small centrally located point situated on the vertex between the eyes. 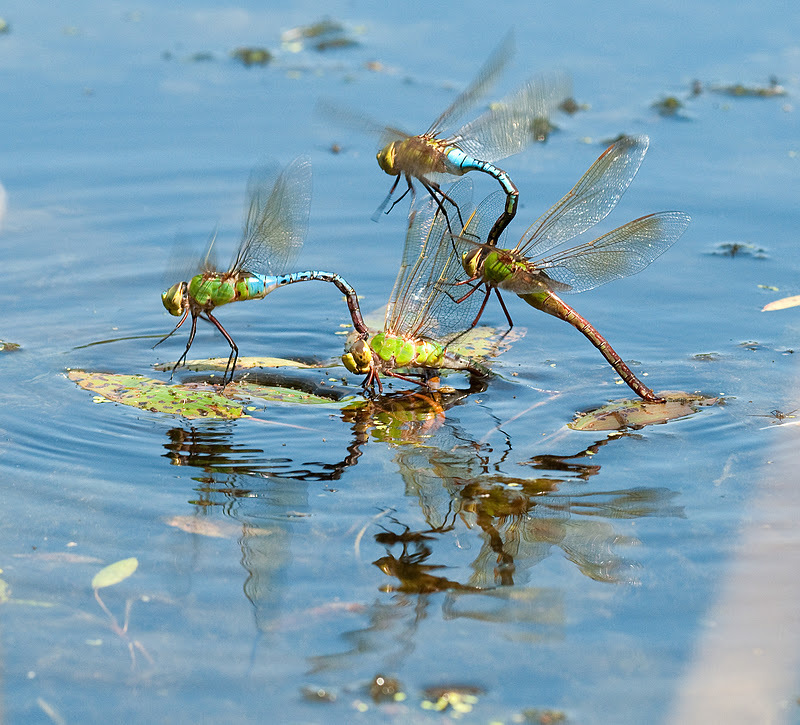 I call this one "Dueling Darners"! 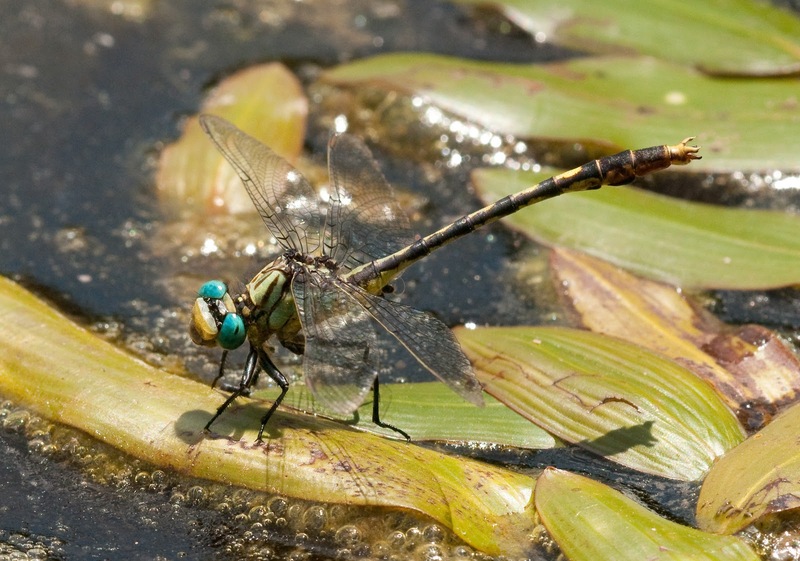 These large, beautiful Green Darners are very aggressive and the male will jealously guard his mate as she dips her abdomen under the water, splits a plant stem and deposits her eggs. 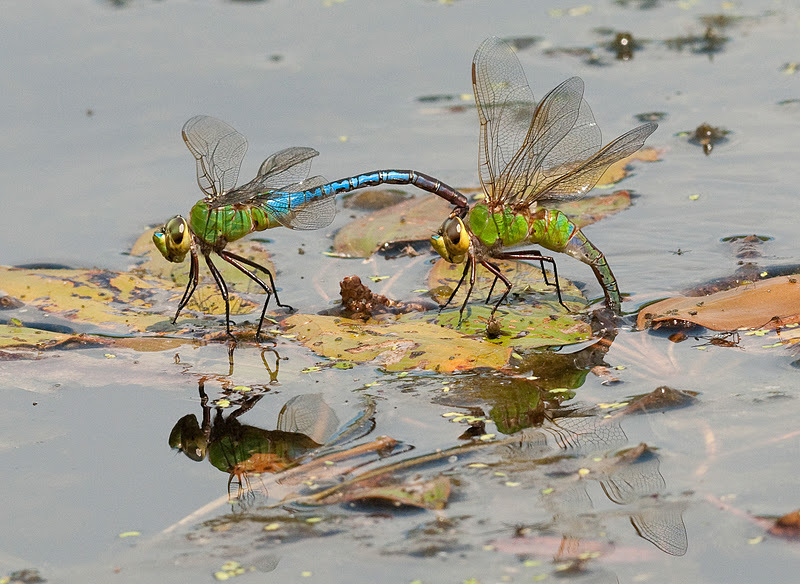 This behavior is referred to as "contact guarding", and it ensures that a female is only producing eggs with her mate's genetic donation. The males here were constantly fighting and ramming each other in competition. Male Ruby Meadowhawk. 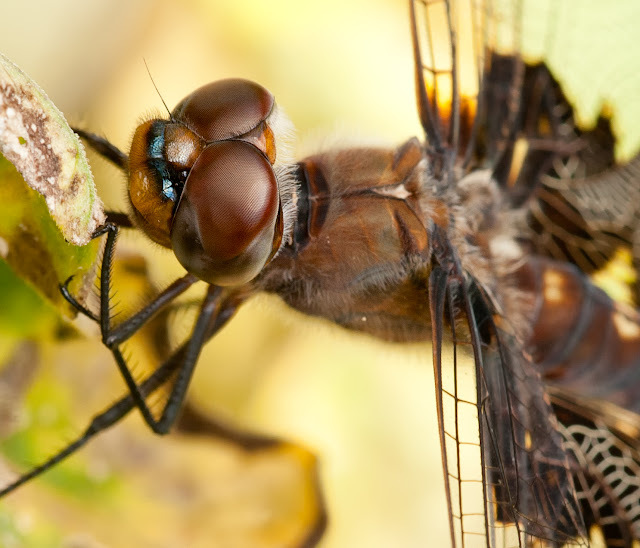 This species will sit very still even when you get close. They pick the most interesting places to perch. Another Male Ruby Meadowhawk, and another interesting perch! This is so "Zen-like"! 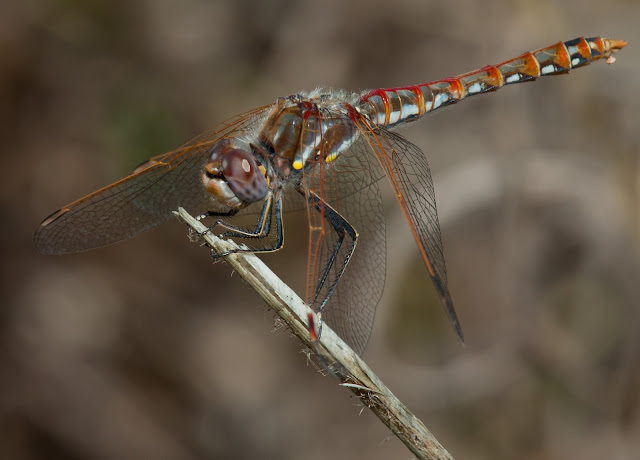 I think this is a female Ruby Meadowhawk, although could be a teneral male. 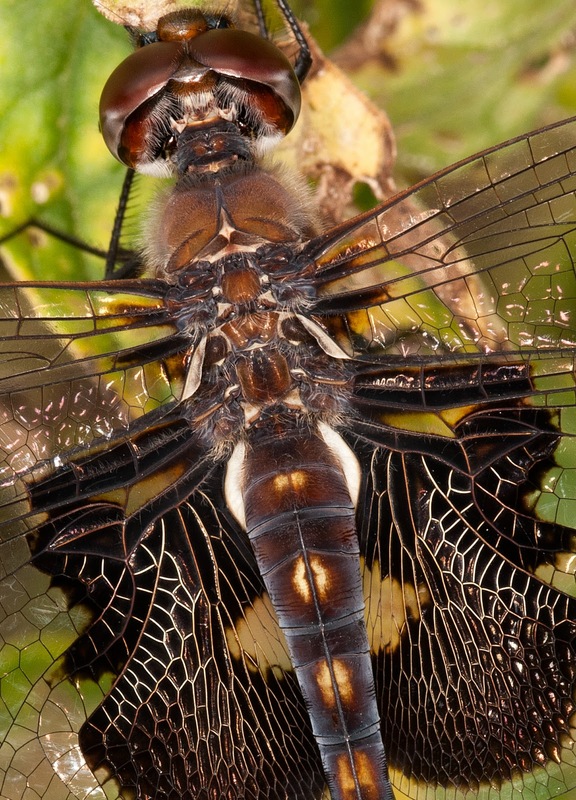 I love to see the wings reflect the light! 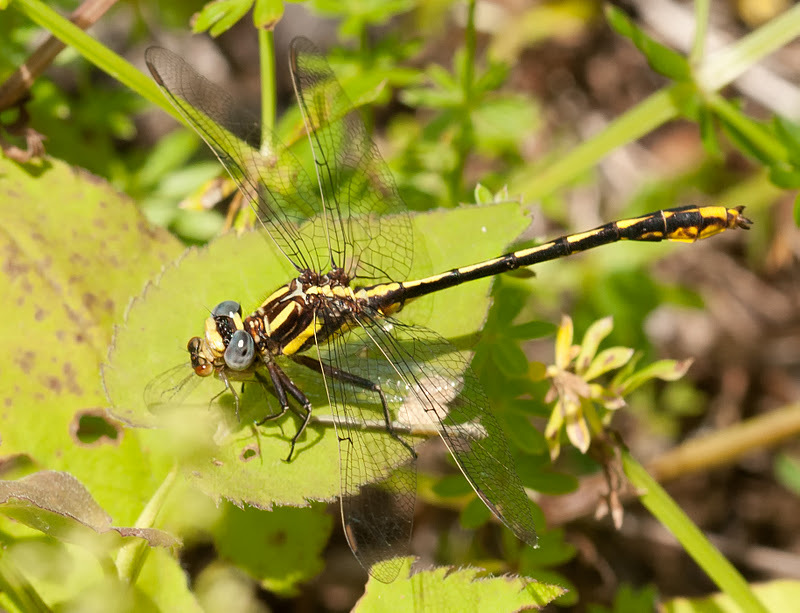 This is the same Lancet Clubtail above, eating a damselfly. 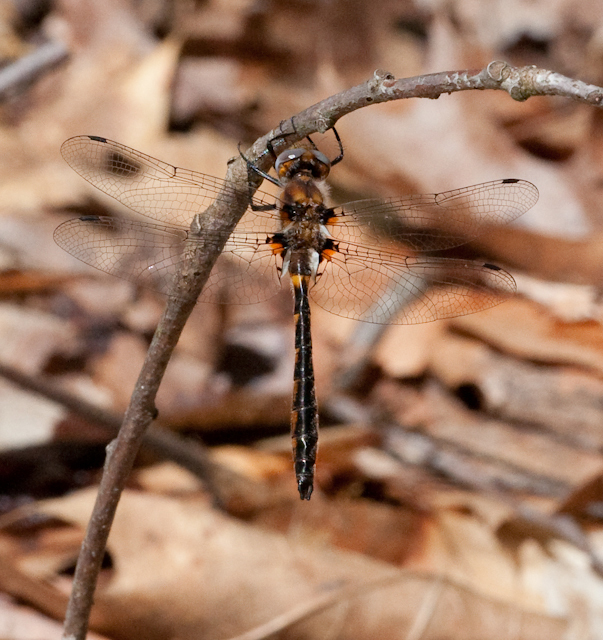 Another shot of a female Black Saddlebag (or possibly immature male). 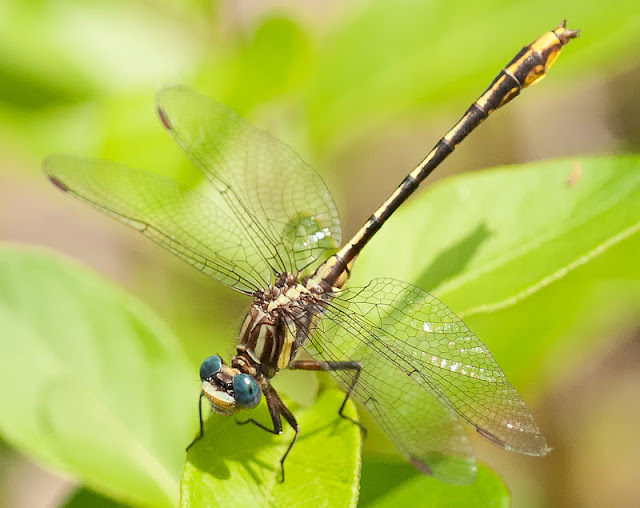 The adult male's abdomen is duller in color.